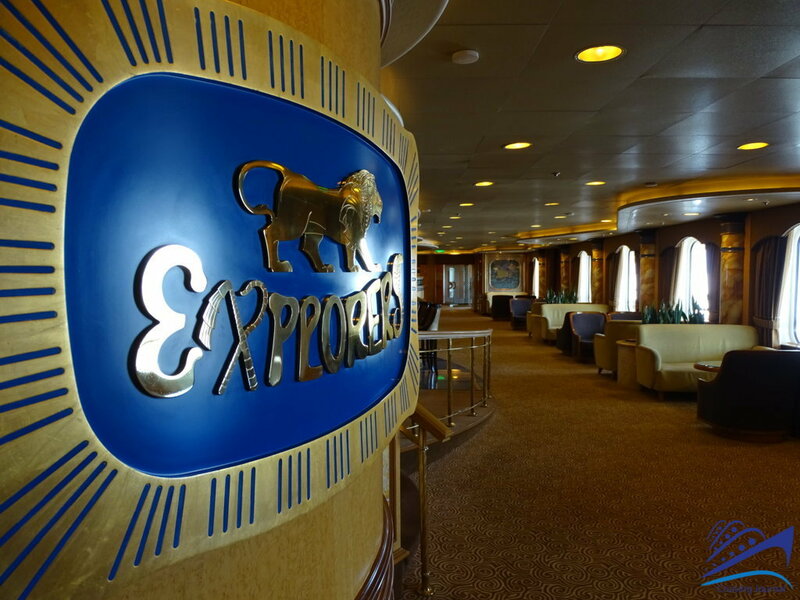 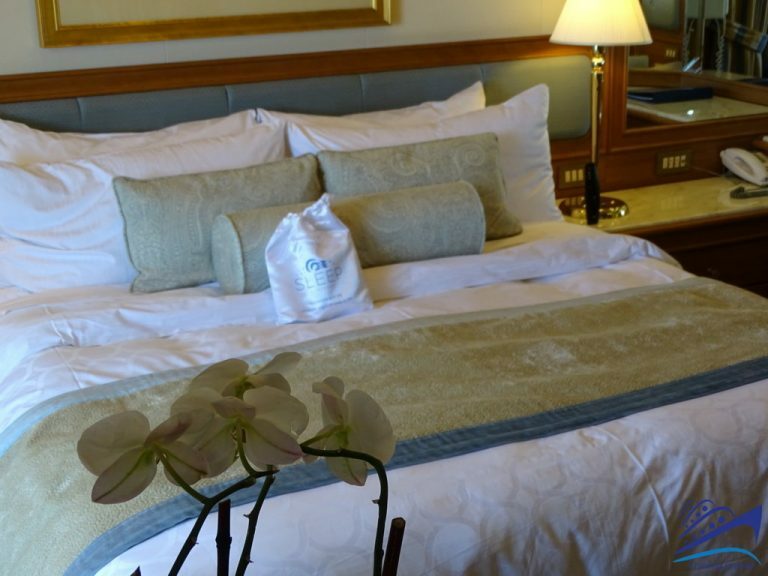 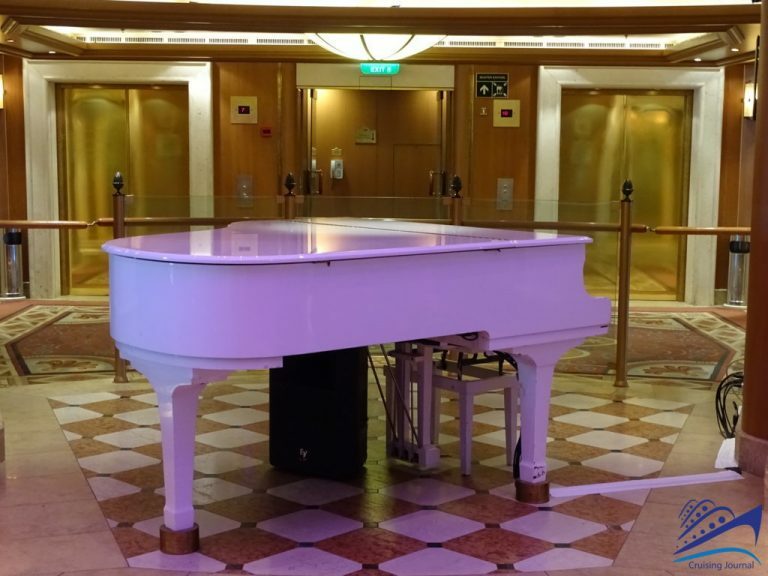 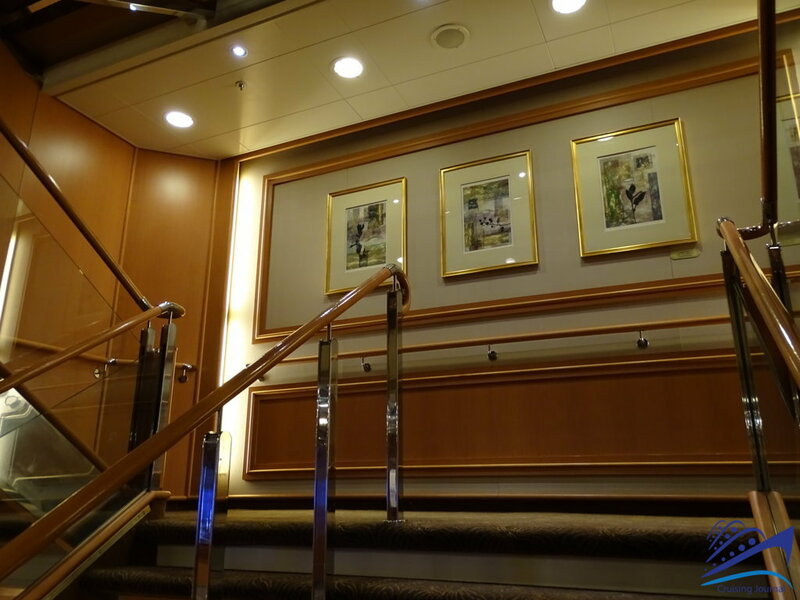 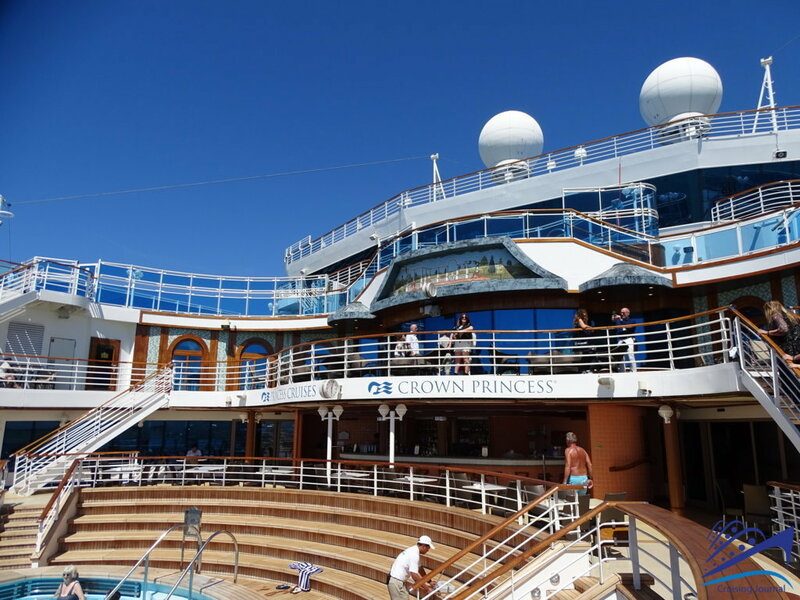 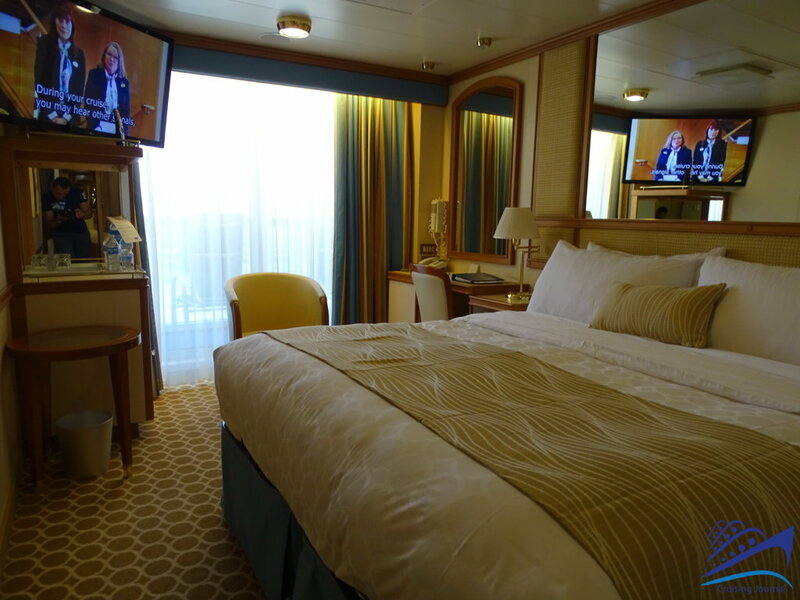 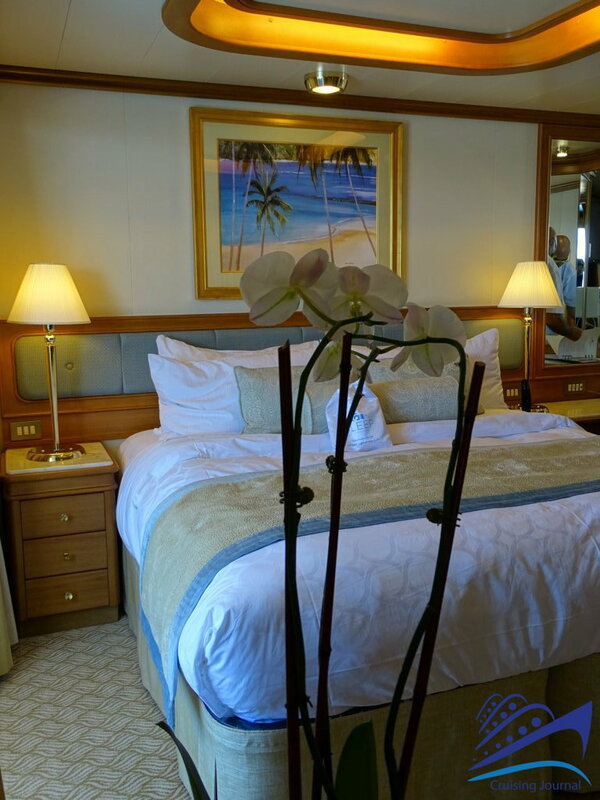 The Crown Princess, a Grand-class ship built by Fincantieri in 2006, turned 12 this year but she certainly carries her age well both from a general maintenance point of view to the up-to-date layout of the rooms and the onboard facilities. 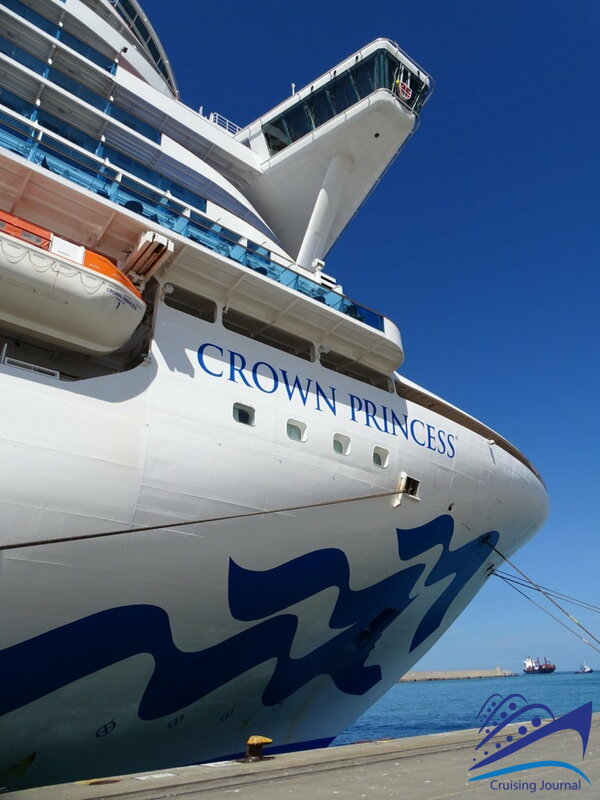 Its size, just over 113 thousand tons and 288 meters in length, makes it a rather large unit, even though in recent times we have become accustomed to far greater dimensions. 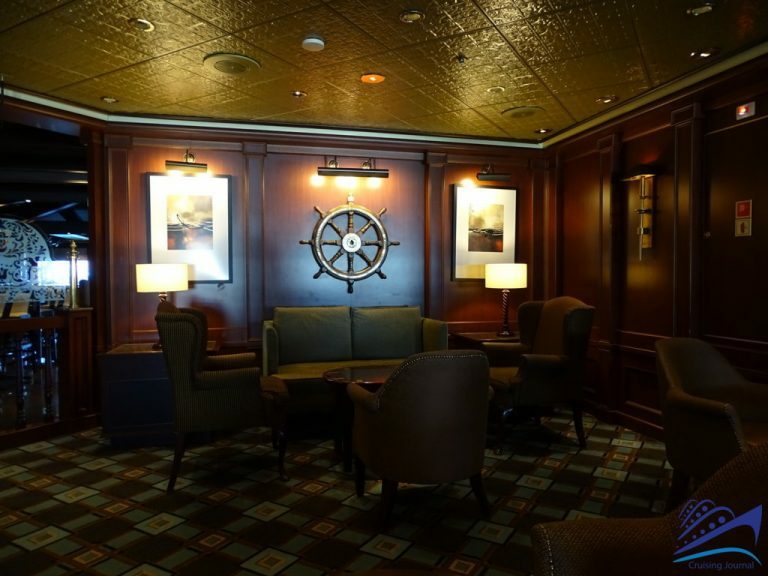 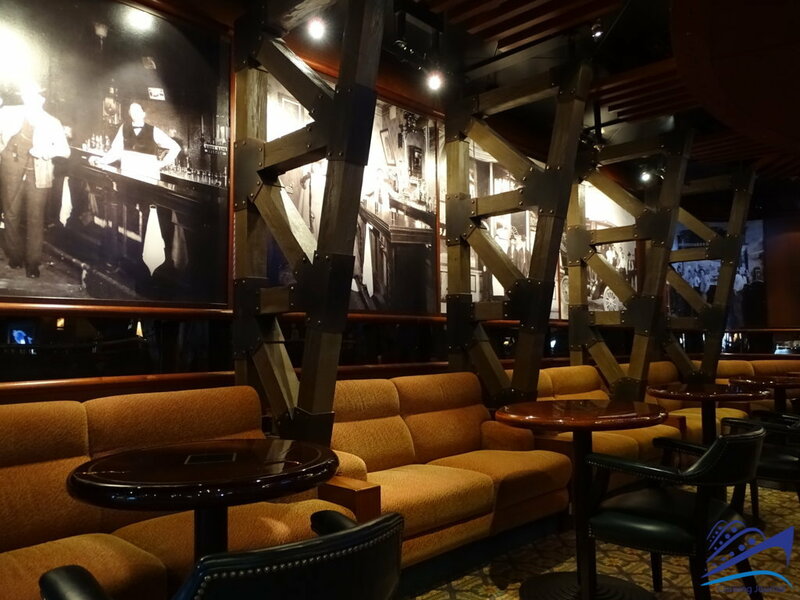 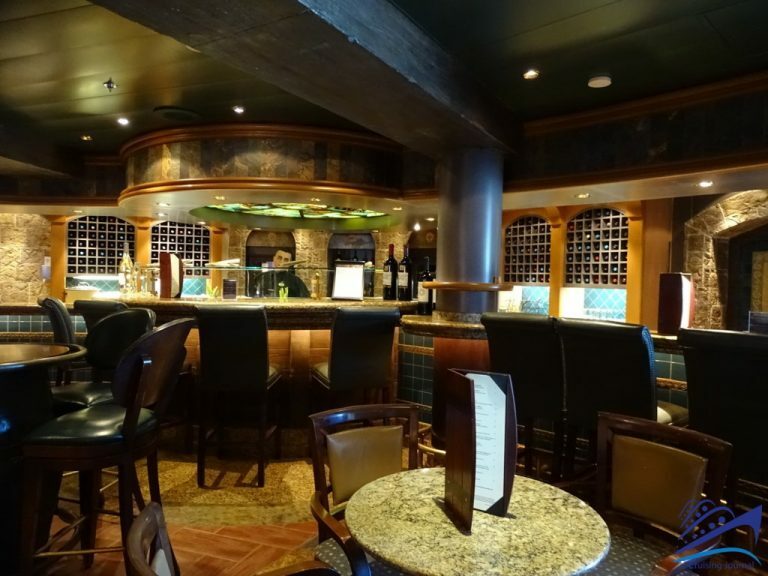 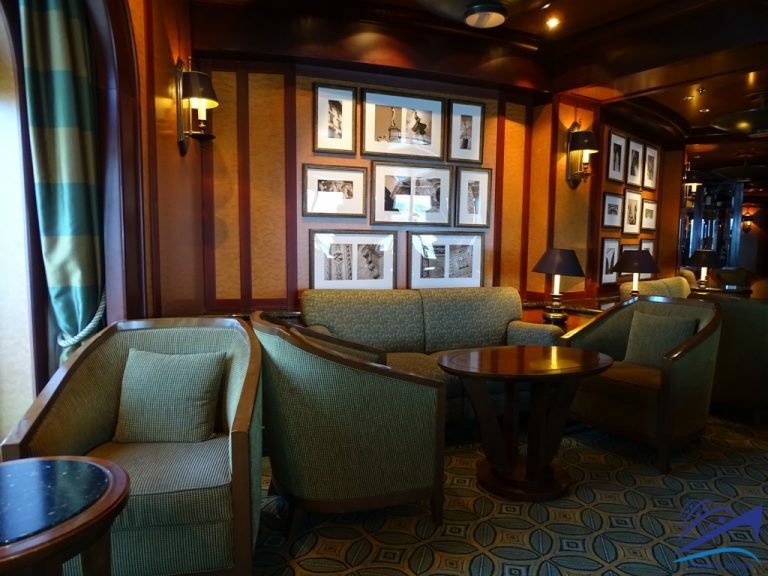 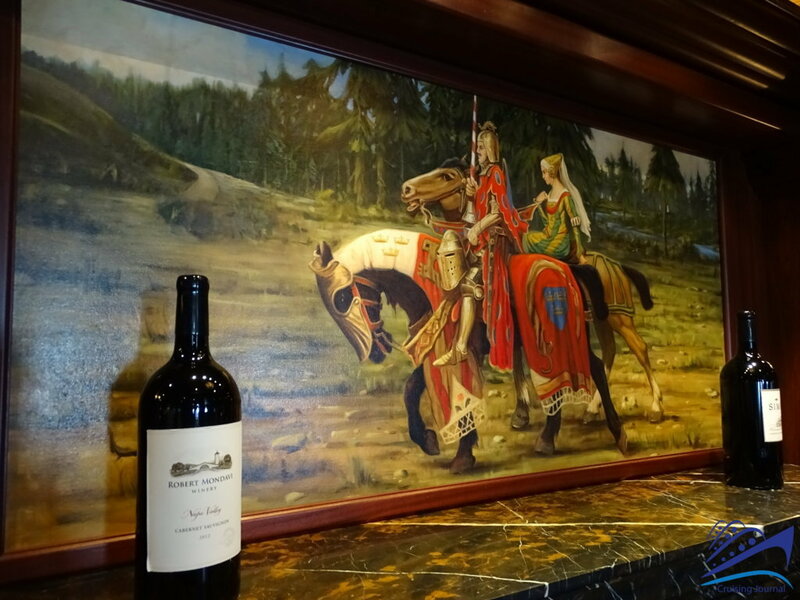 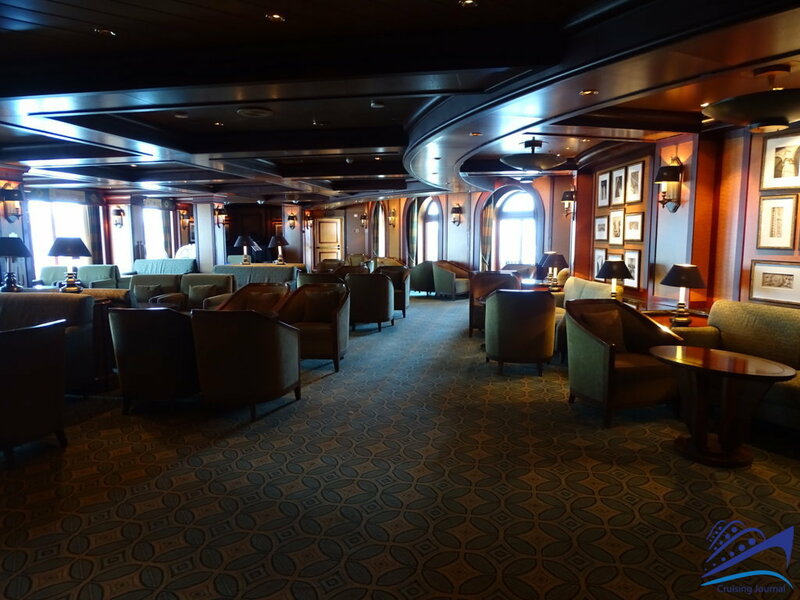 The interior design of the ship is classic for the most part but it can also be very elegant drawing inspiration from a number of themes going from the English pub to the Far West and right up to the knightly decor of the Crown Grill restaurant. 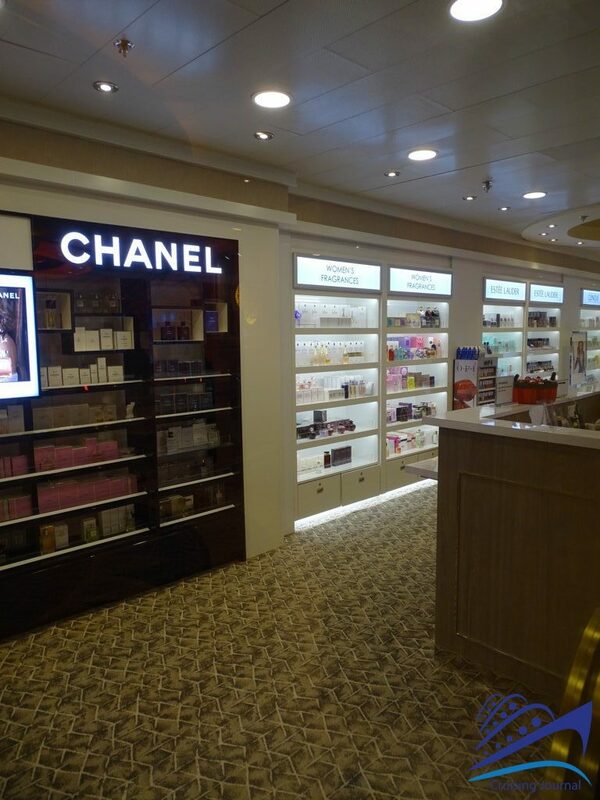 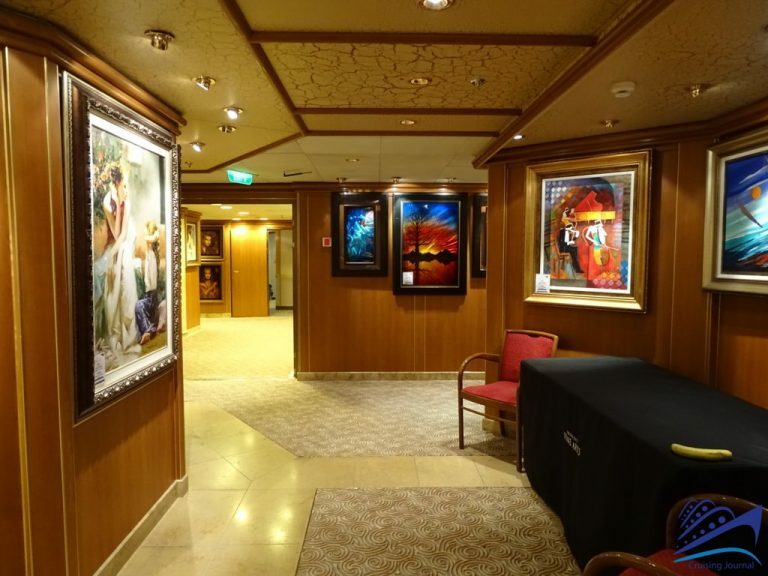 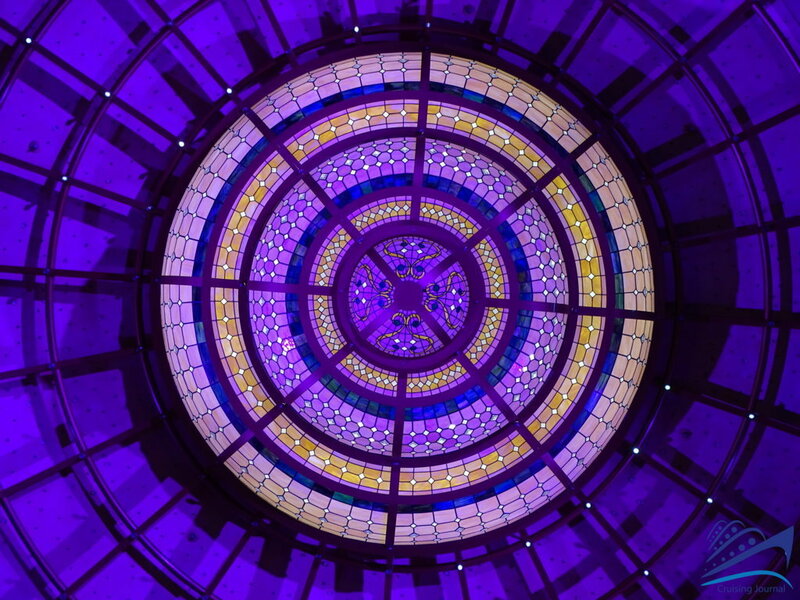 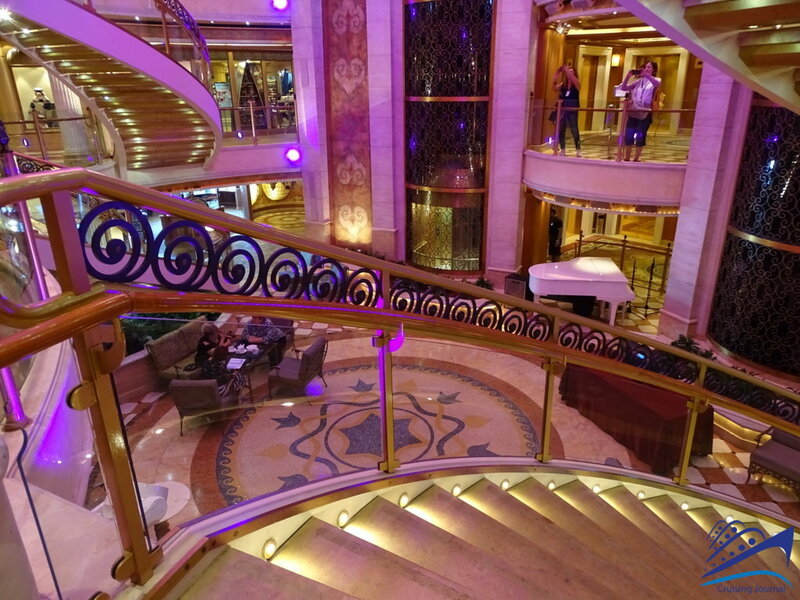 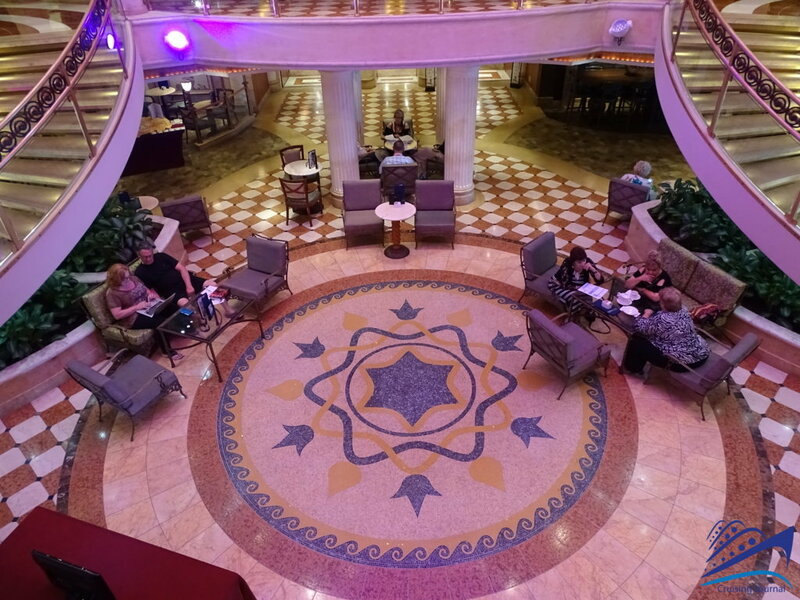 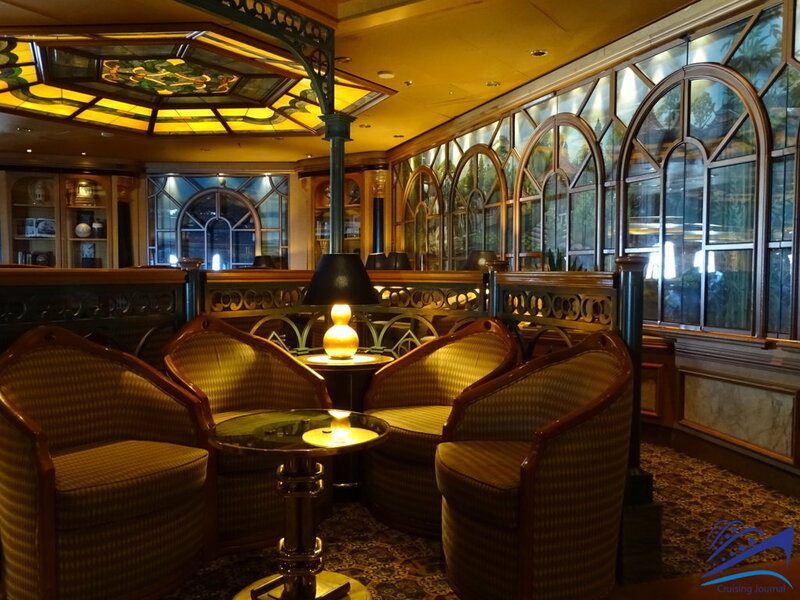 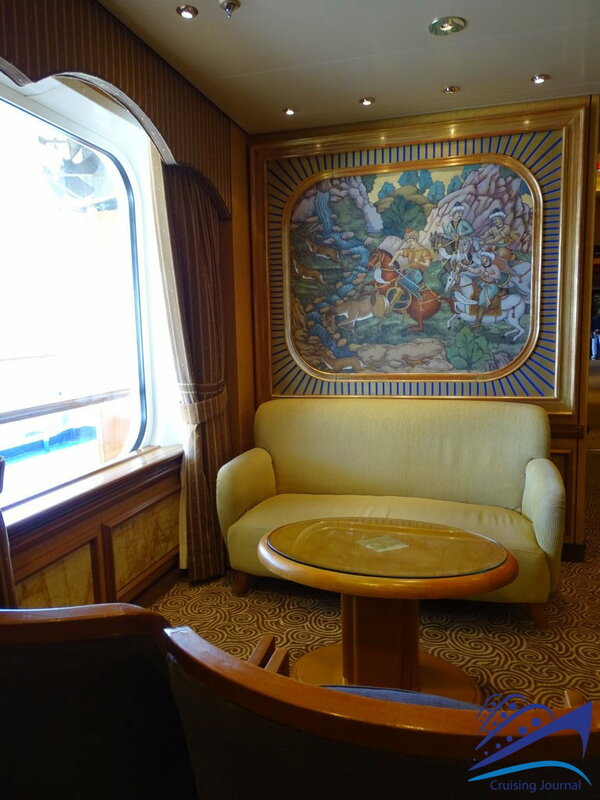 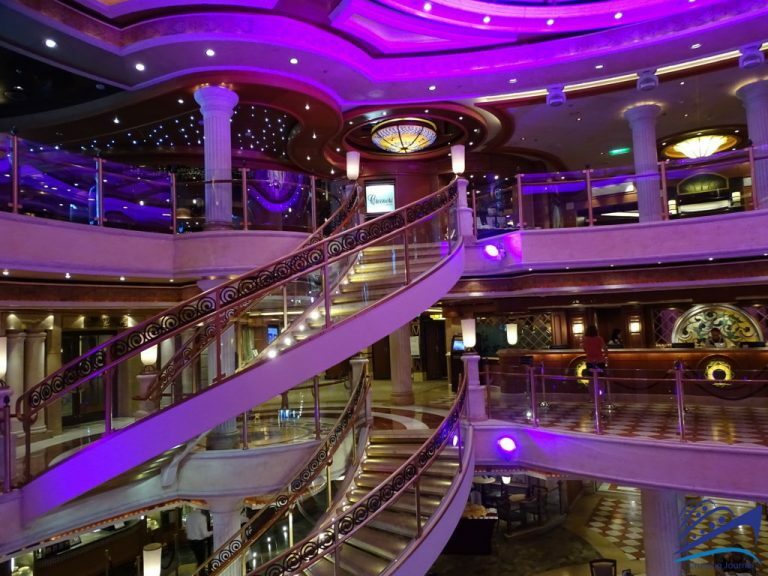 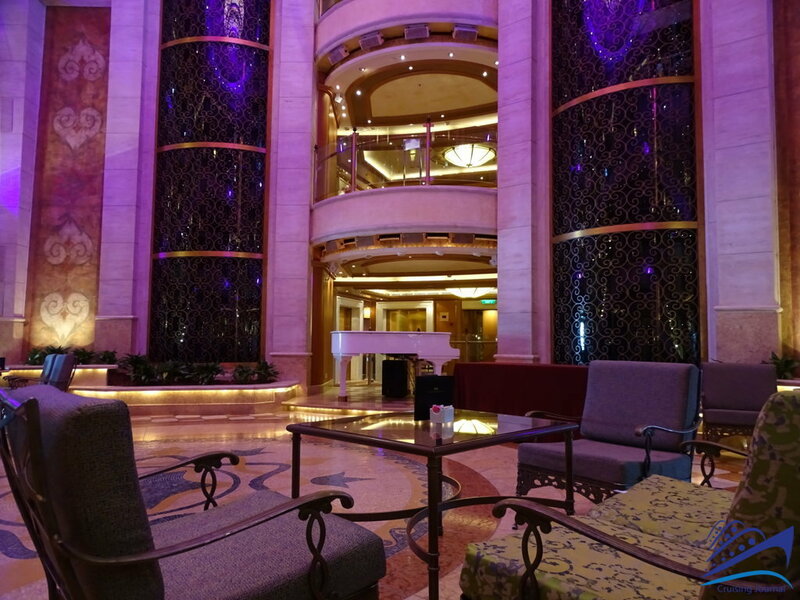 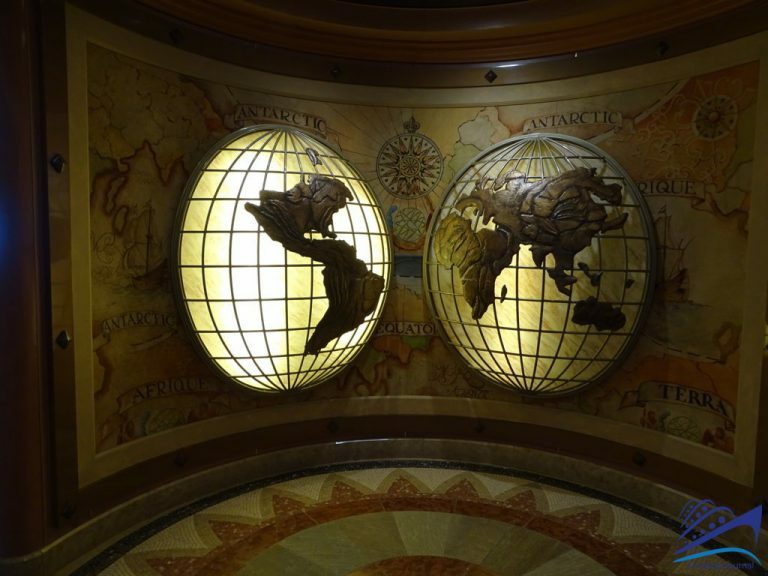 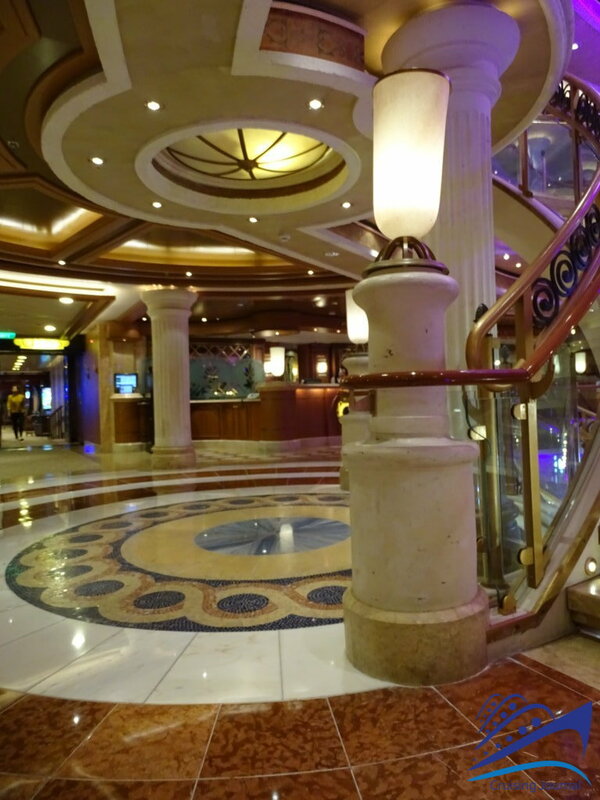 Numerous works of art embellish the ship and it is a pleasure to walk amongst the shops, lounges and cozy bars. 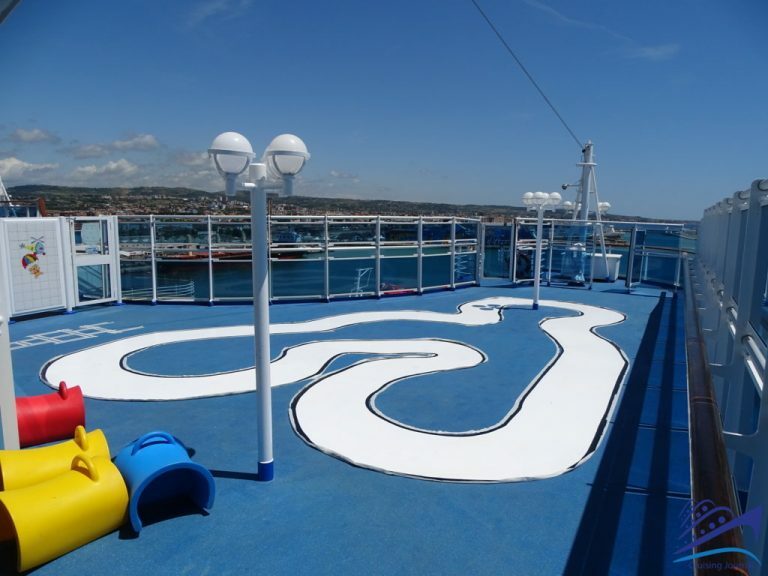 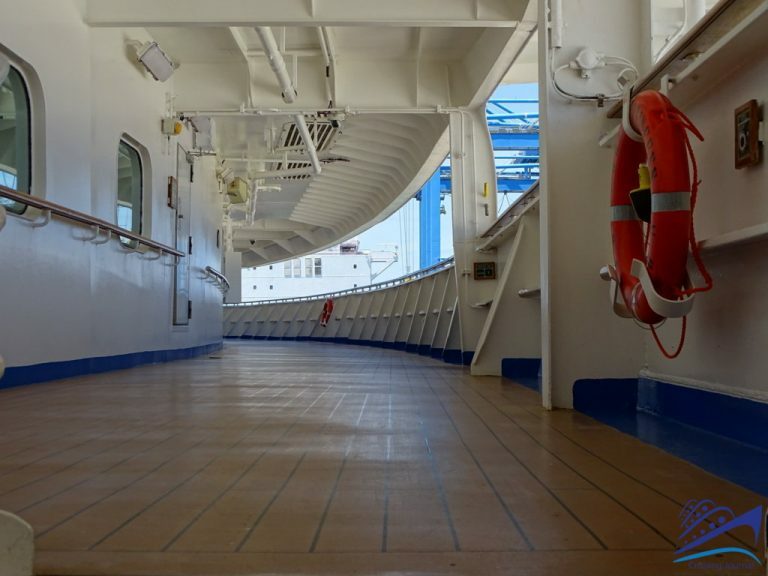 Most of the common spaces are located on Decks 5, 6 and 7. 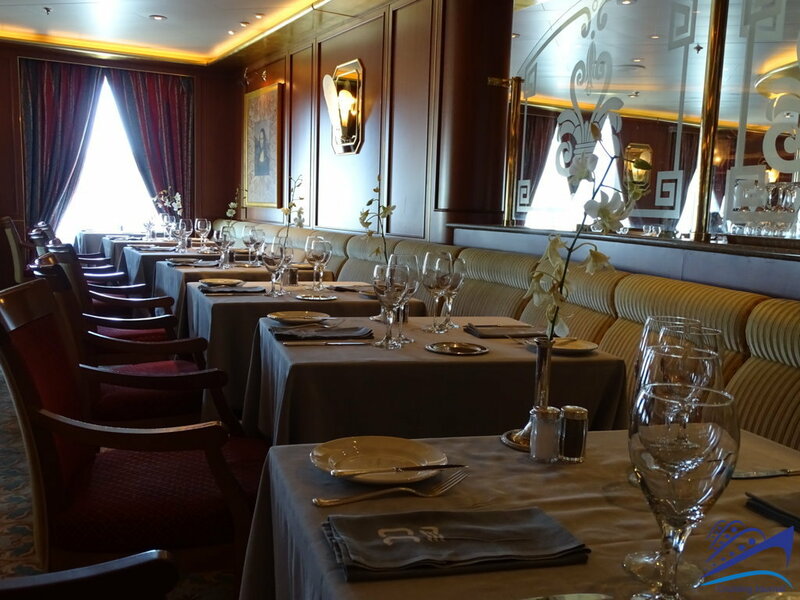 The upper levels of the ship house a number of venues and facilities such as restaurants, the Lido and the Spa. 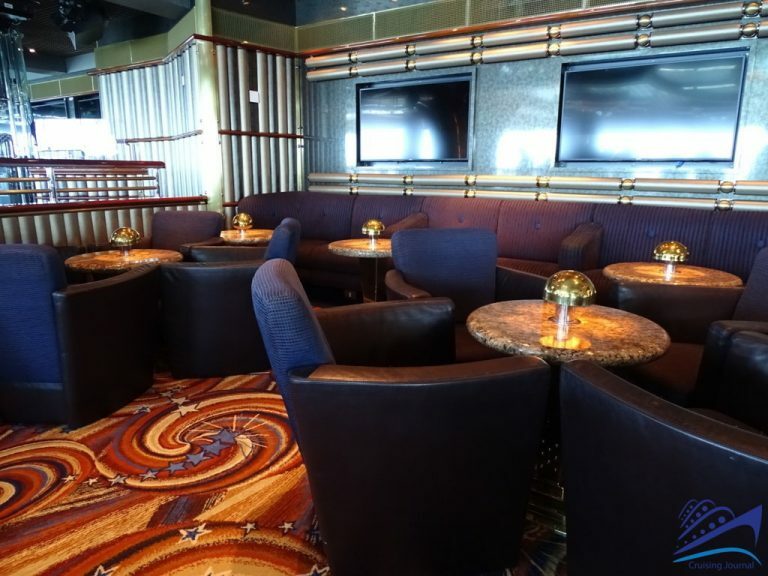 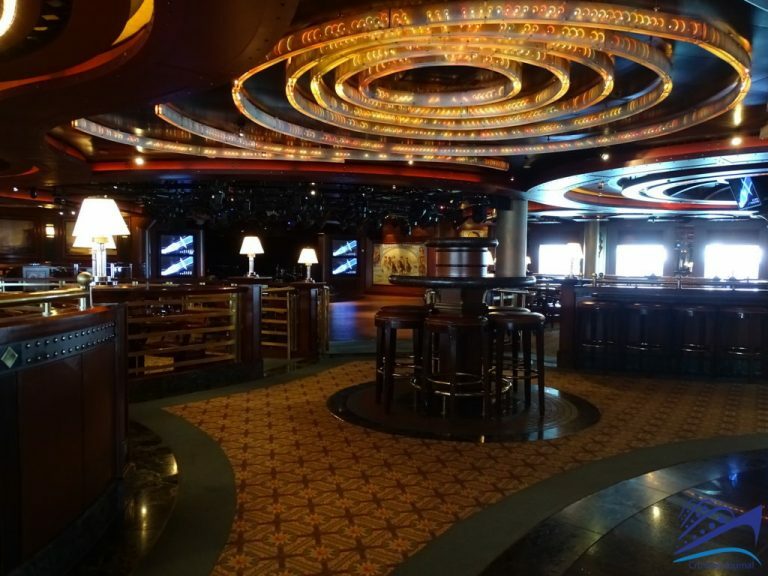 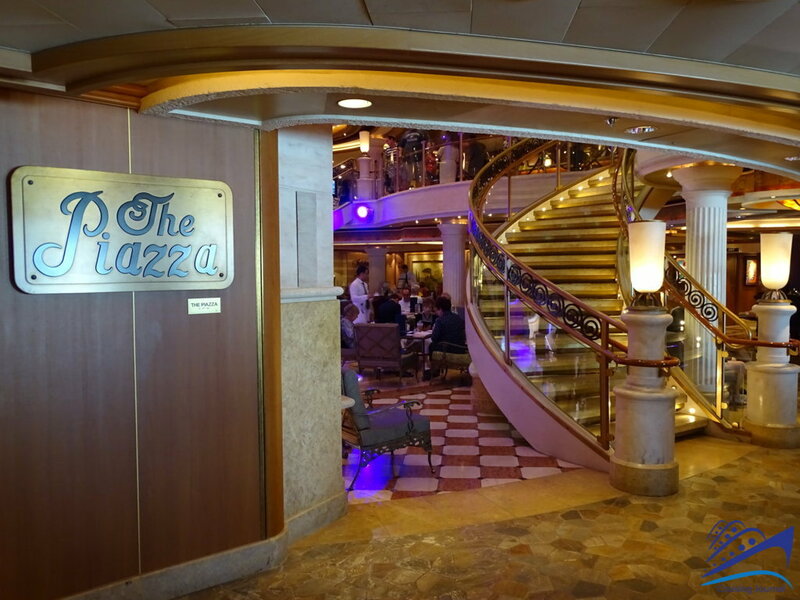 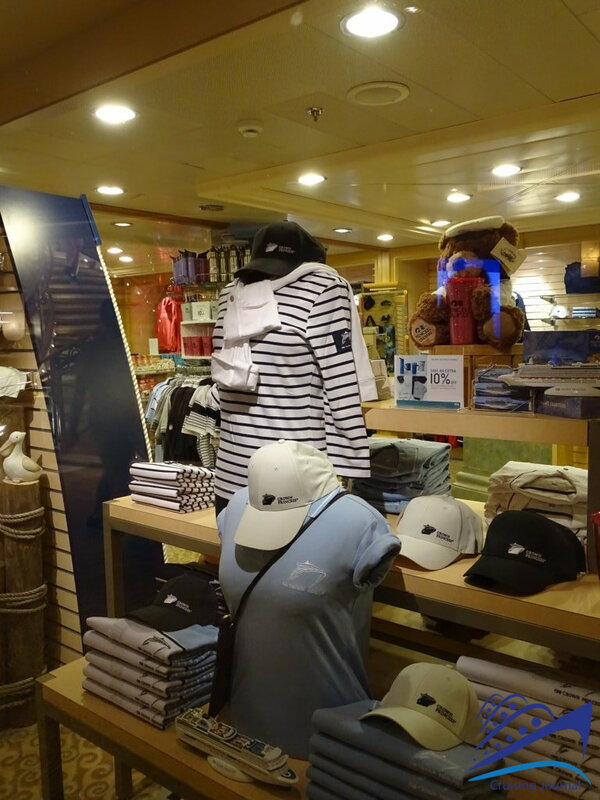 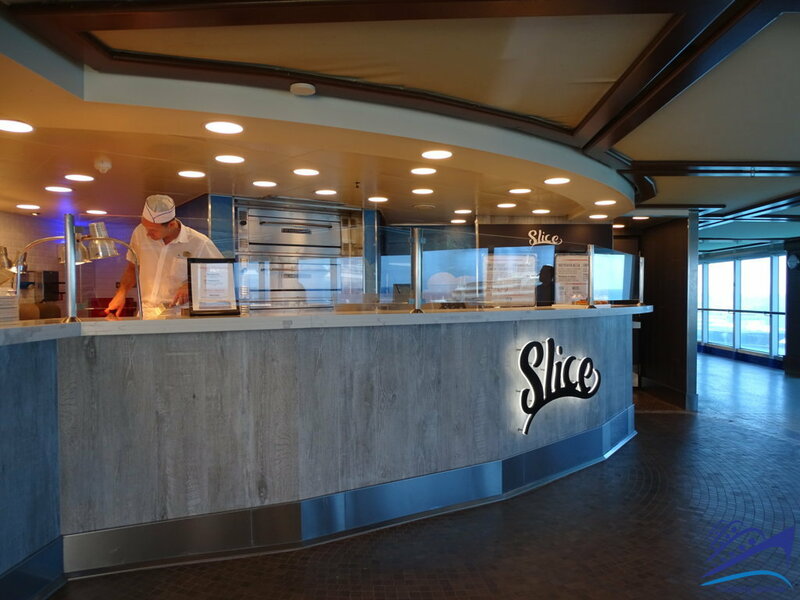 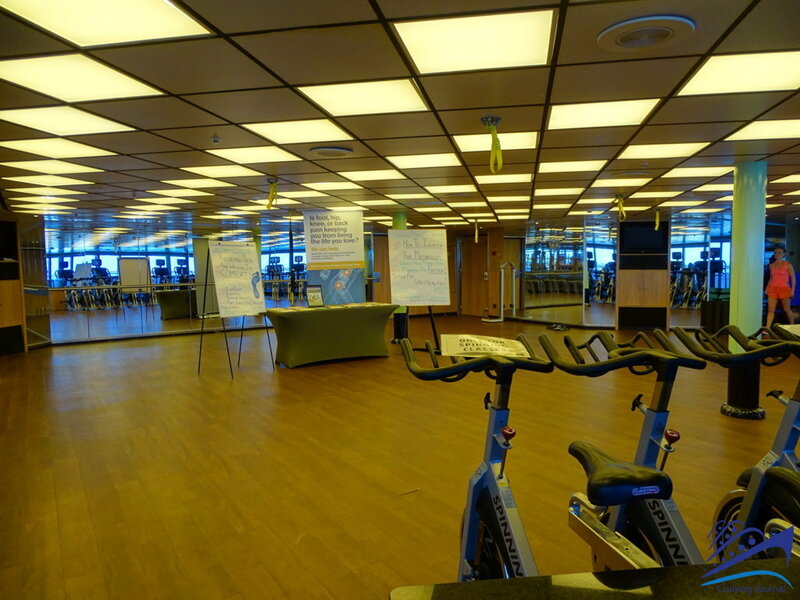 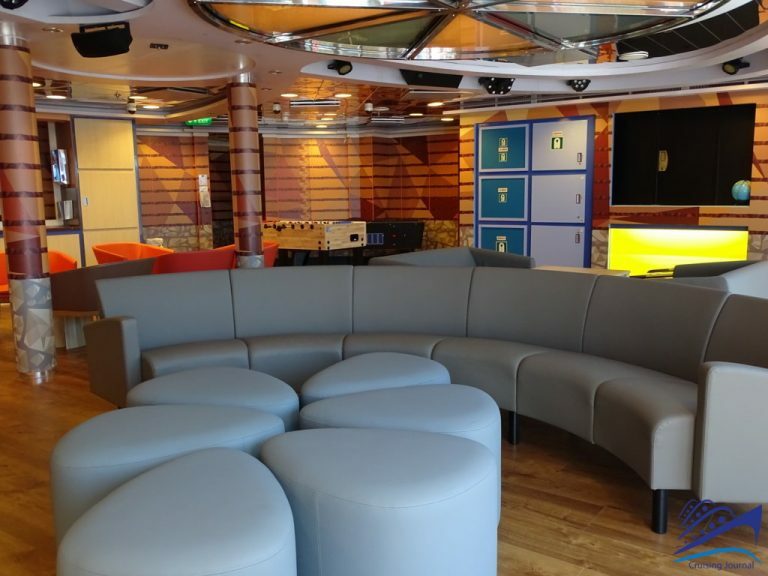 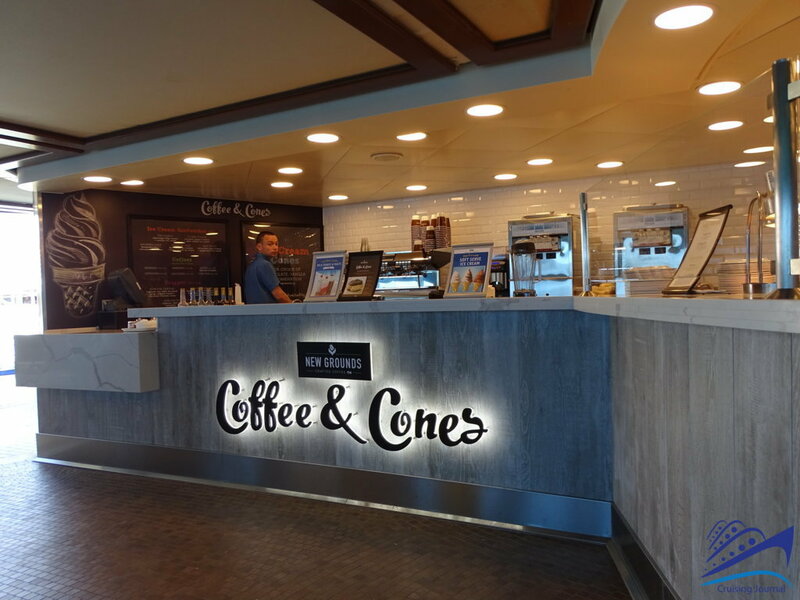 Deck 5, which is the first of the decks that passengers have access to with the exception of the medical center located at Deck 4, is where you will find the hub of the ship: The Piazza. 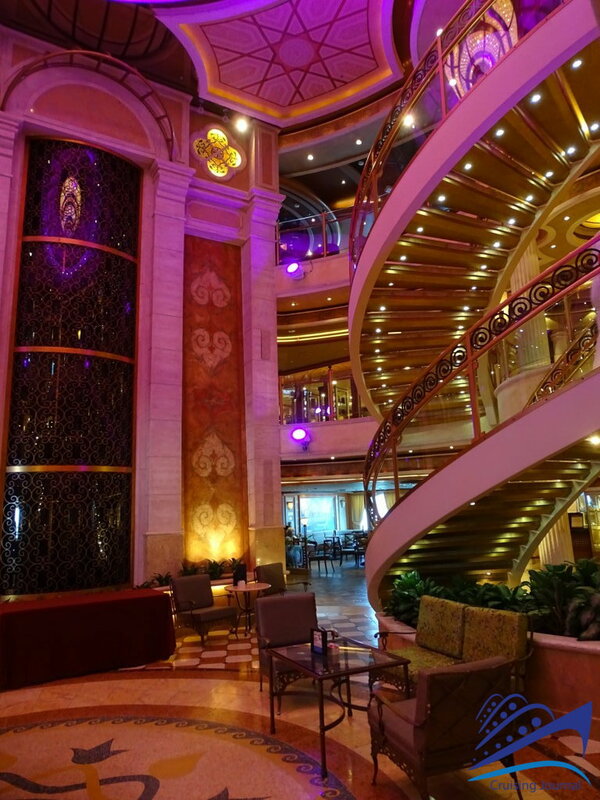 It is an elegant and spacious atrium with panoramic elevators on one side and a winding staircase on the other. 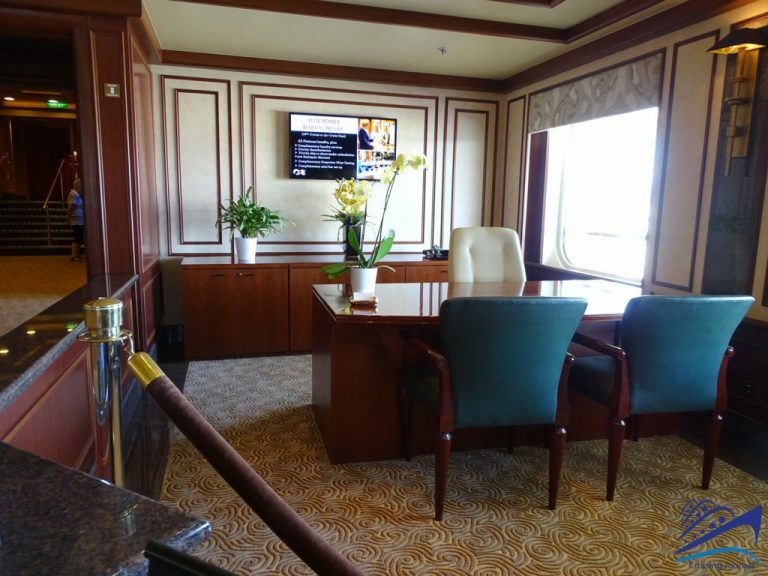 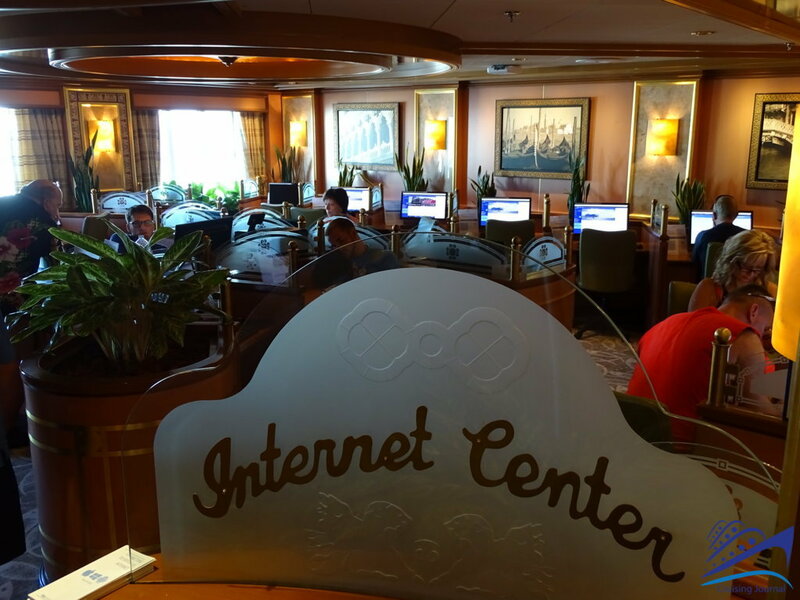 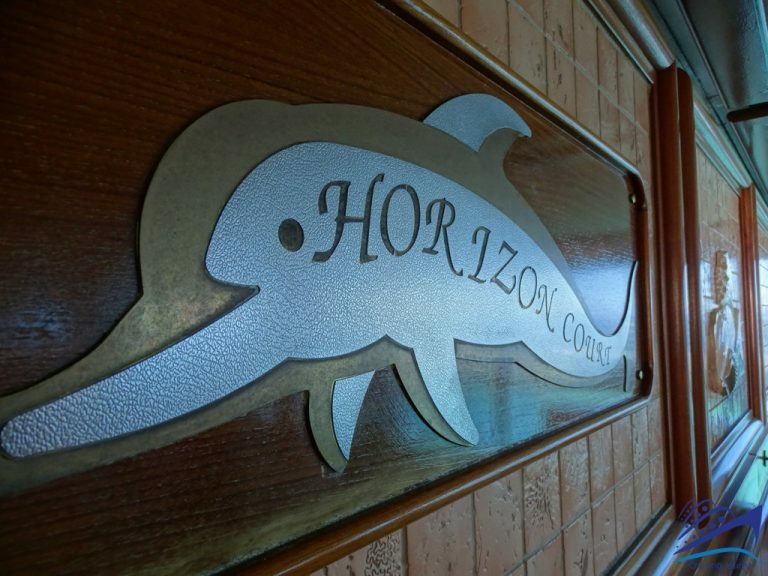 Guest Services, the internet center and our cruise booking offices are all located here. 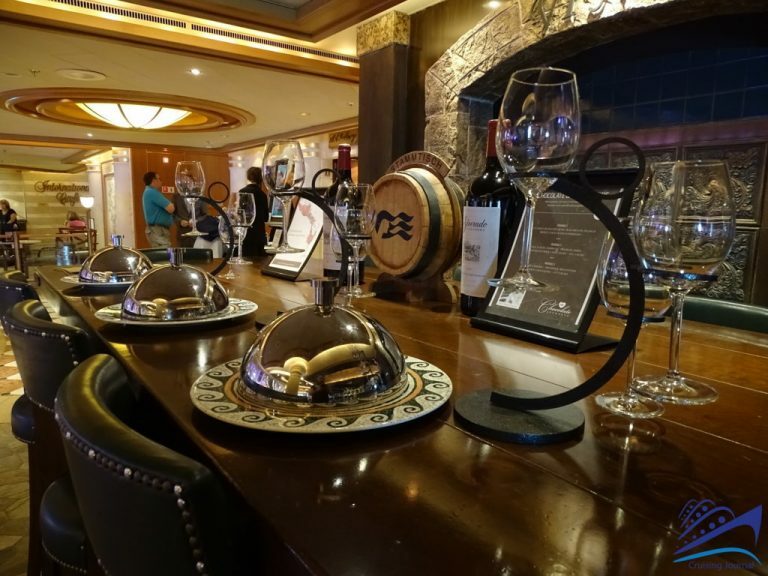 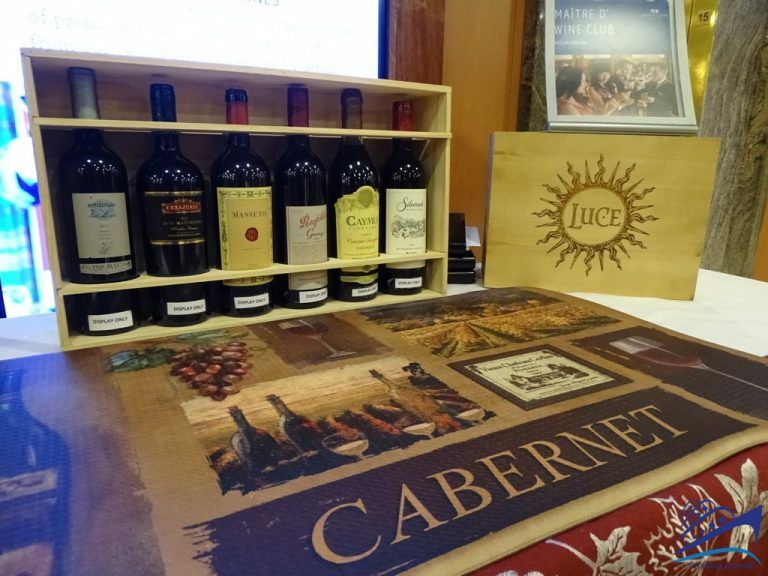 You can enjoy sweet or savory snacks day and night at the International Café; and, enjoy prestigious wines and sample particular food and wine pairings at the Vines Bar. 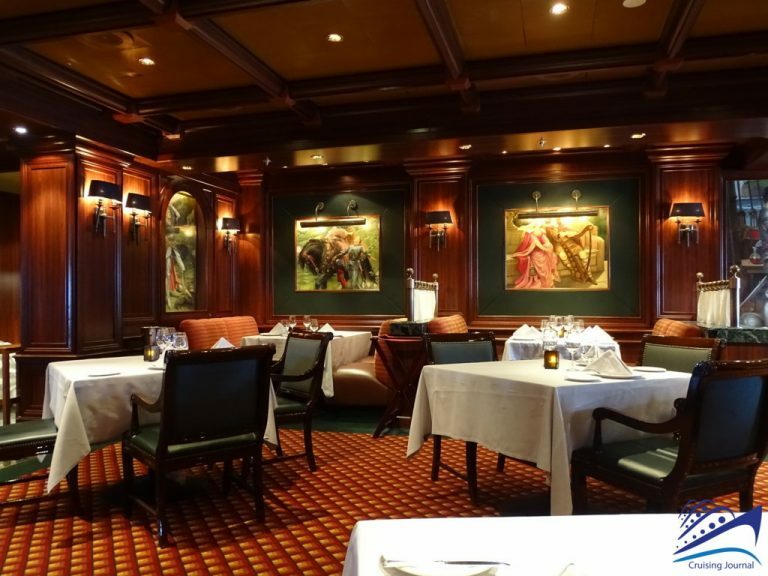 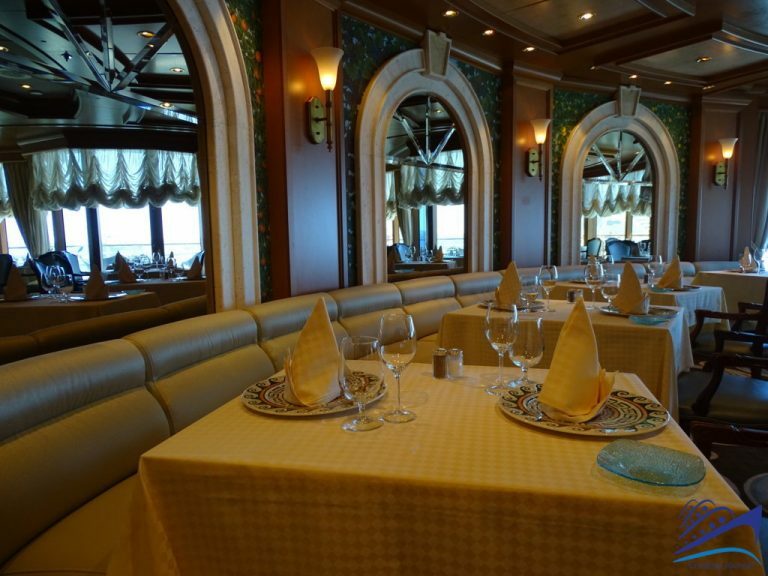 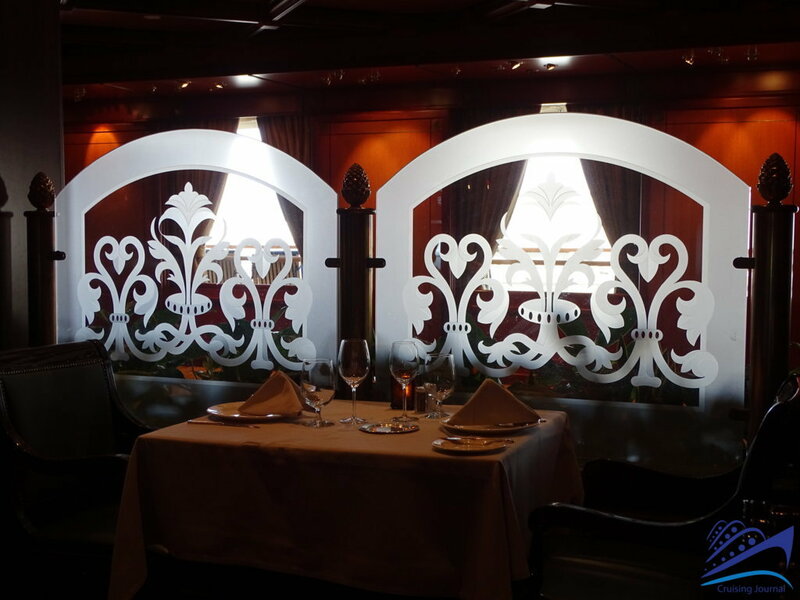 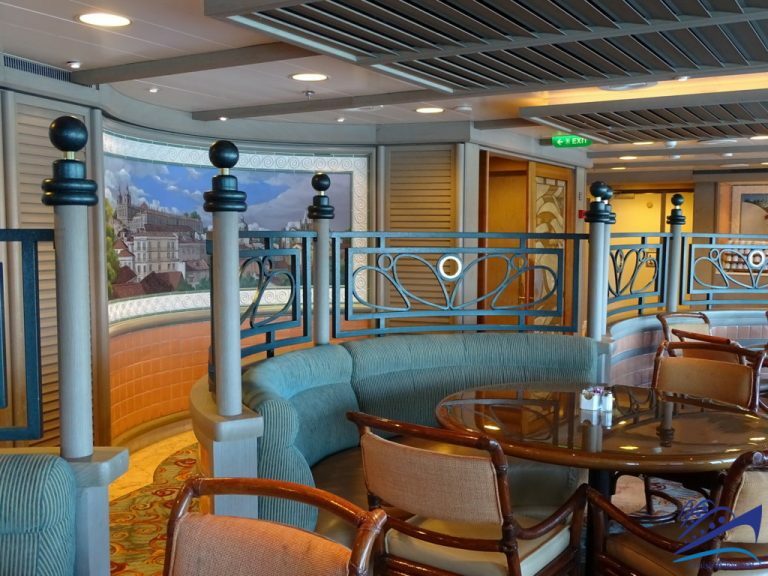 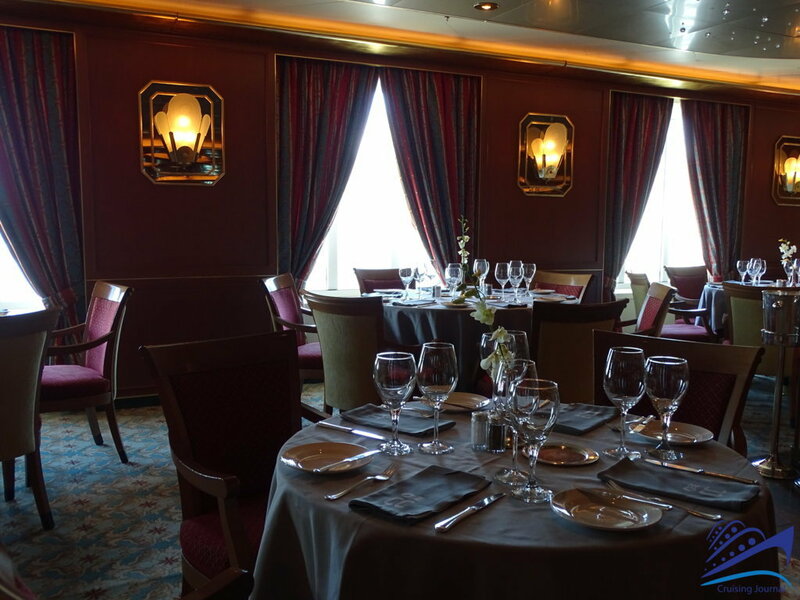 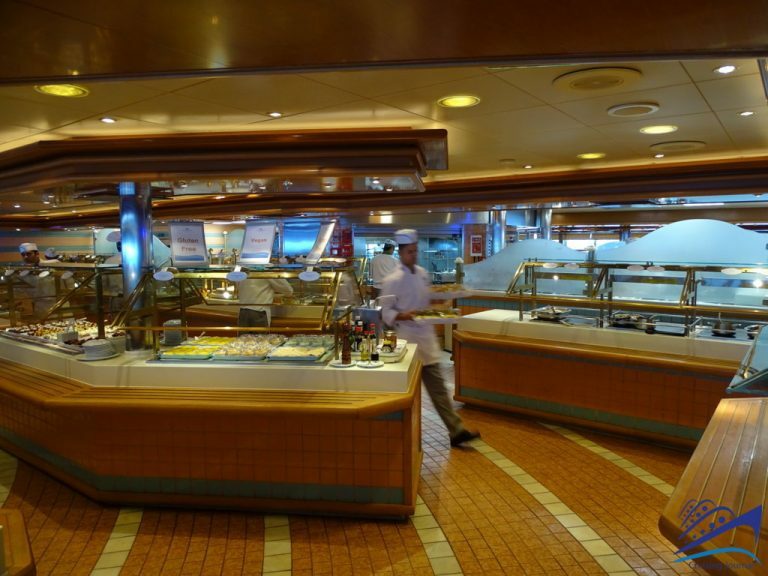 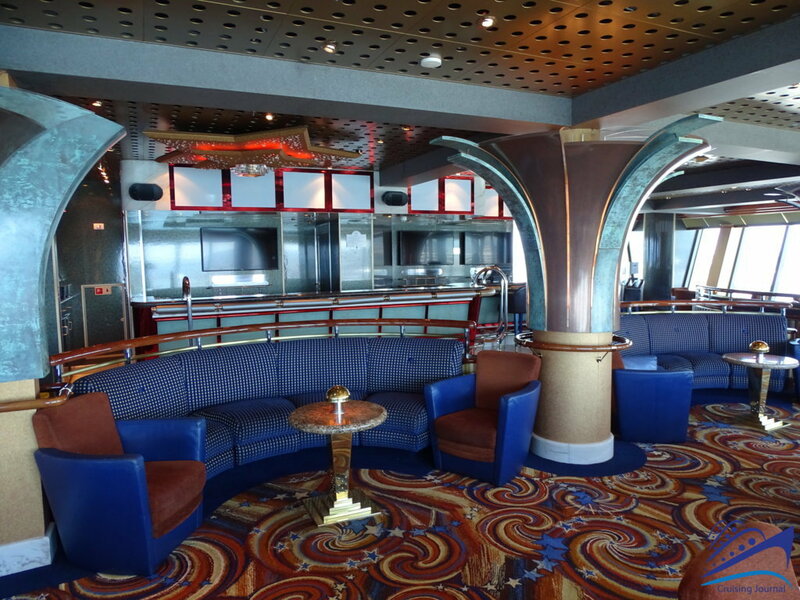 On one end, you have access to the Michelangelo Dining Room, one of the two main dining venues on board the ship. 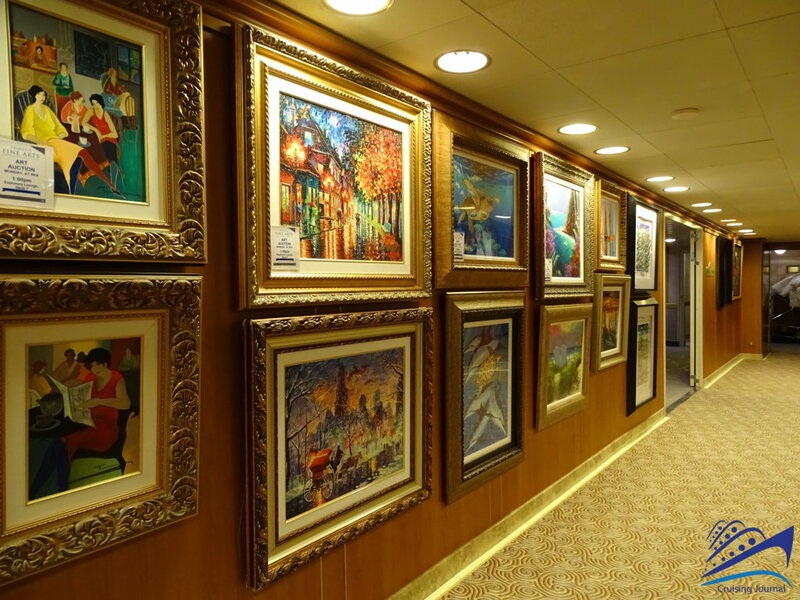 On the other end, towards the bow, is the incredible Art Gallery with its rich collection of paintings and works of art. Deck 6 has such an assortment of beautiful welcoming surroundings and facilities that it will not be an easy choice to decide where to go. 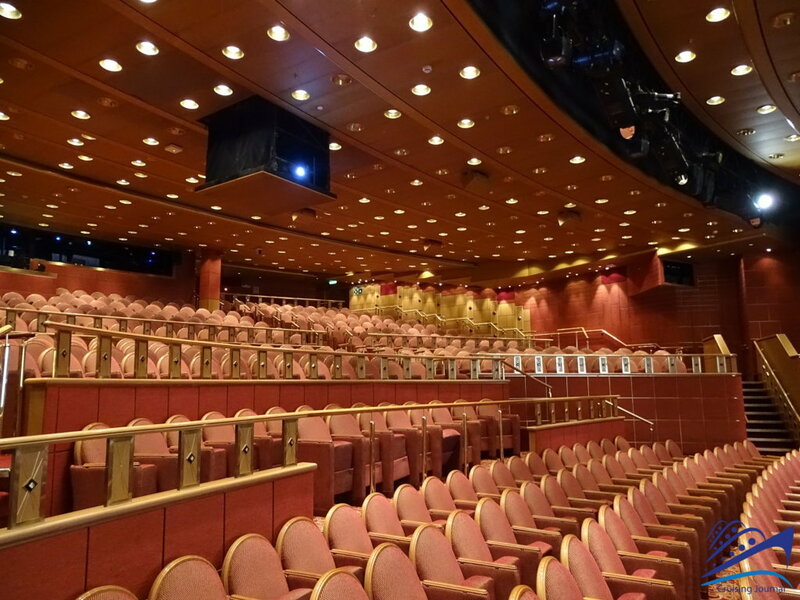 Going forward towards the bow you will find the Princess Theatre where you can enjoy live shows and performances every evening. 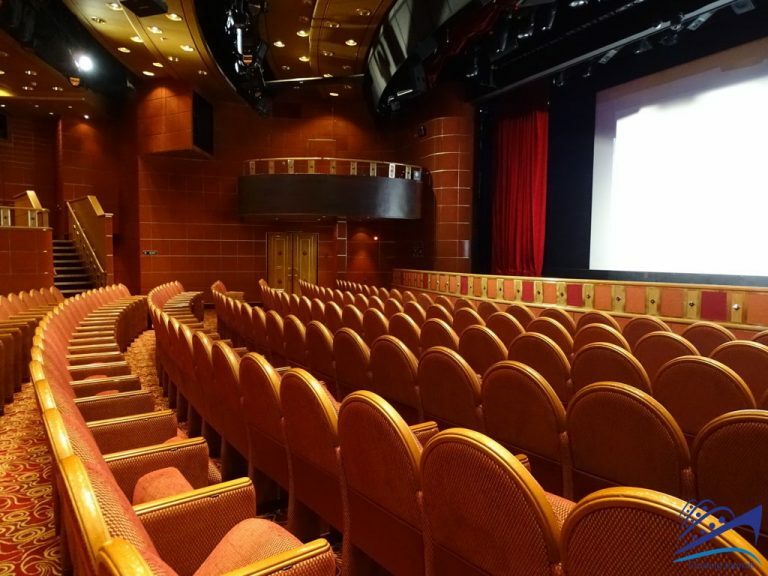 Next to the theatre entrance is the Conference Center with a spacious meeting room available for business meetings. 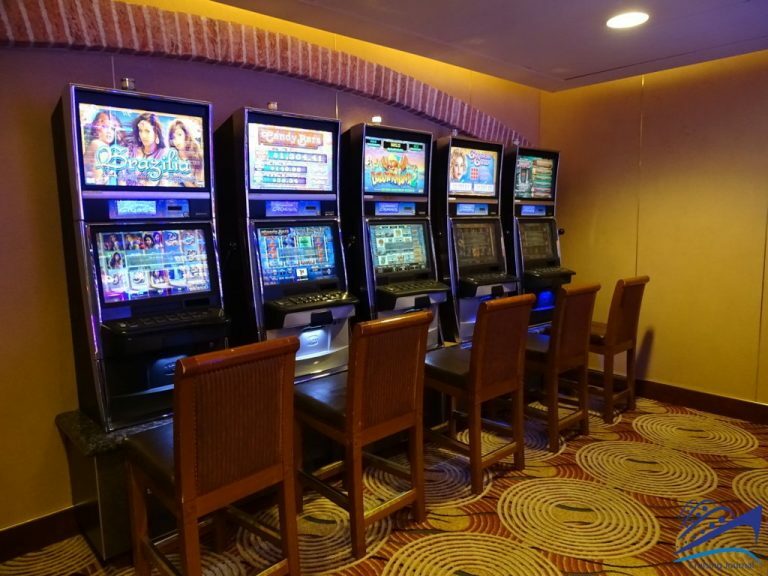 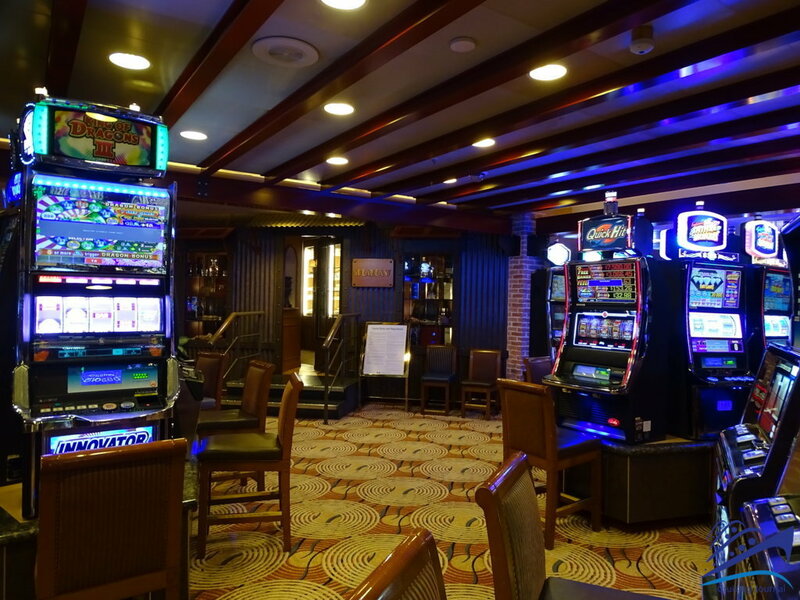 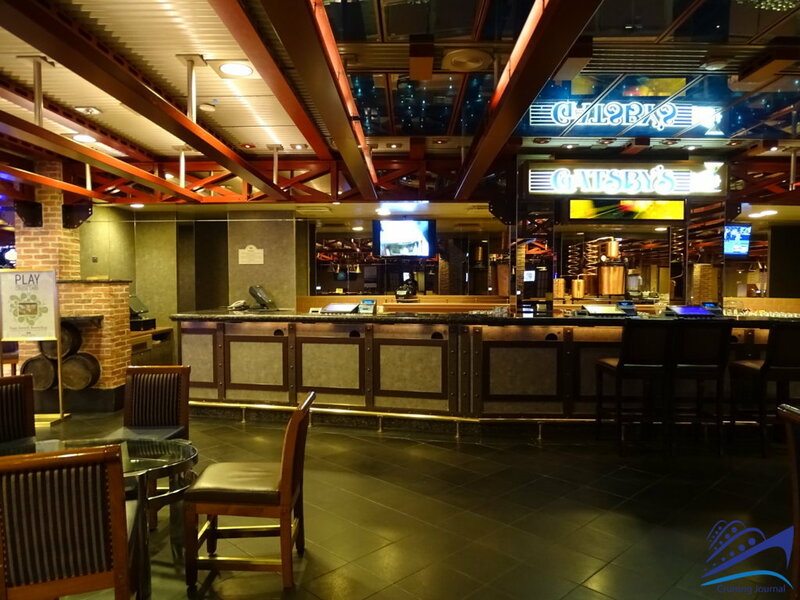 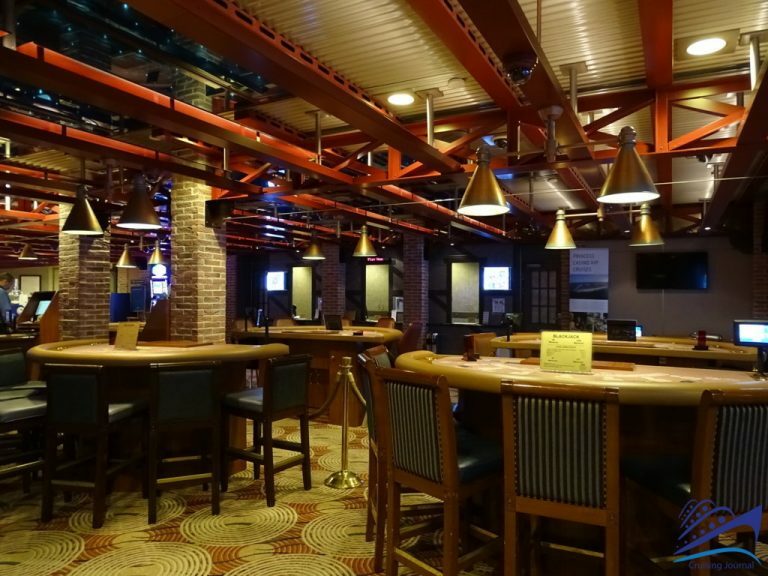 For gambling aficionados there is Gatsby’s Casino that boasts ample gaming space with slots and numerous table games and the Casino Bar ready to serve you. 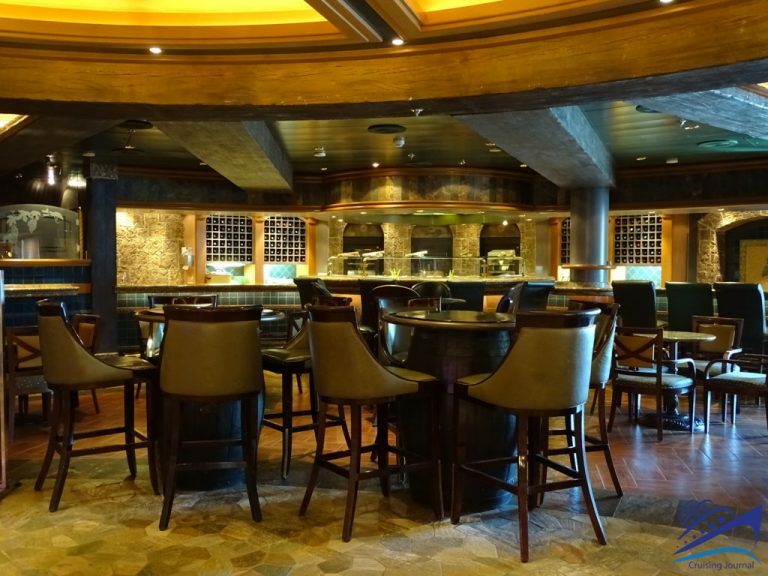 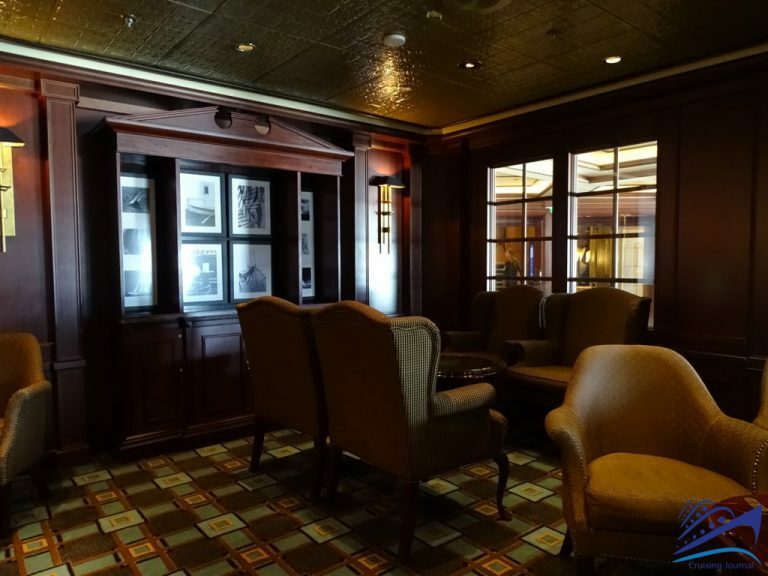 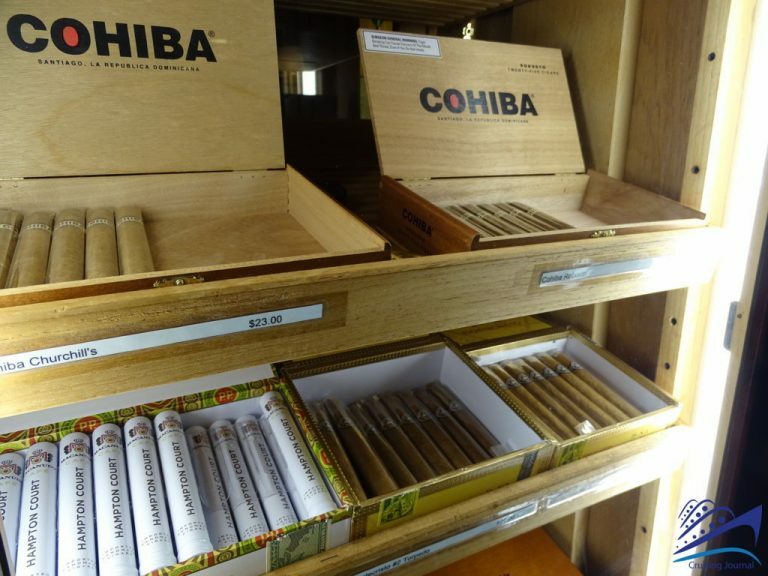 On one side, you will find the Speakeasy Cigar Lounge, a great hideaway where you can smoke a good cigar, chosen perhaps from the excellent selection displayed in elegant showcases. 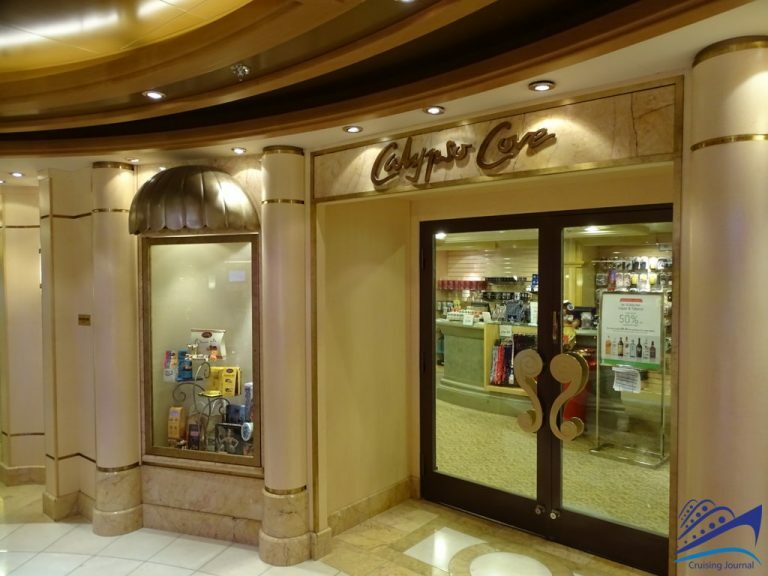 The spacious Meridian Bay and Calypso Cove shopping areas offer a vast selection that goes from clothes to souvenirs and even just window-shopping there is a delightful treat. 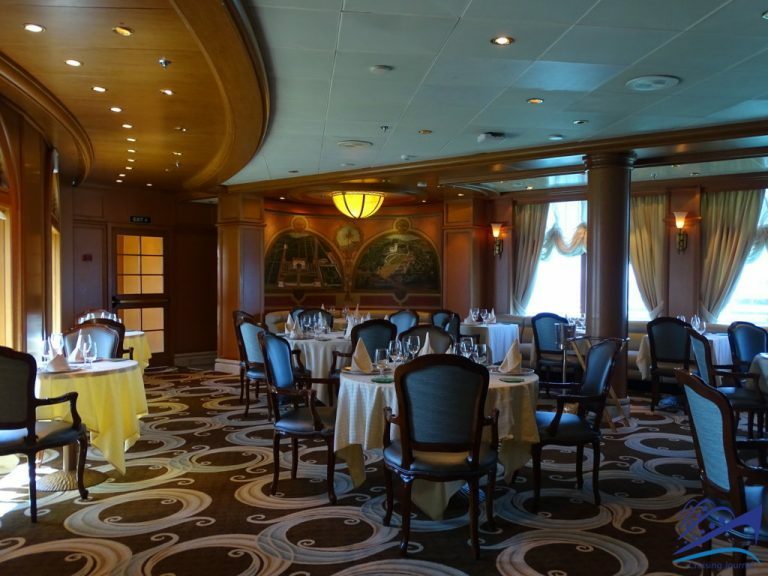 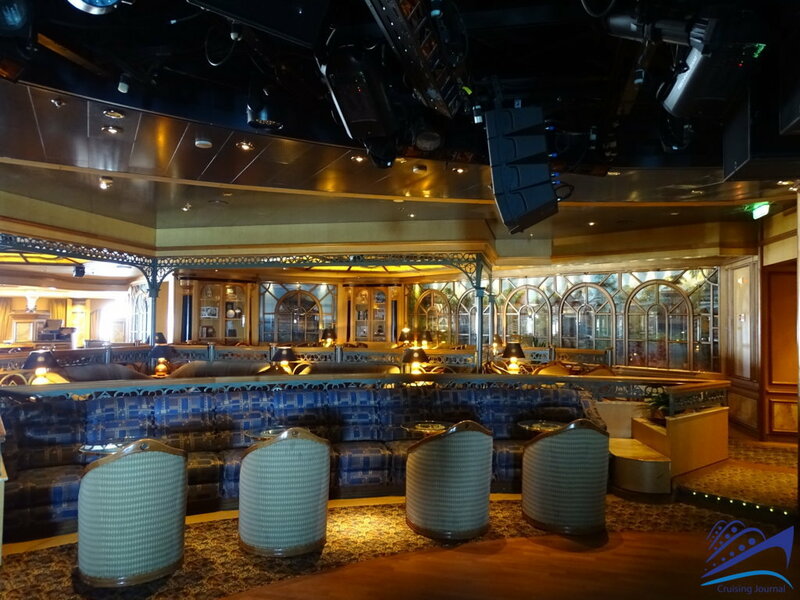 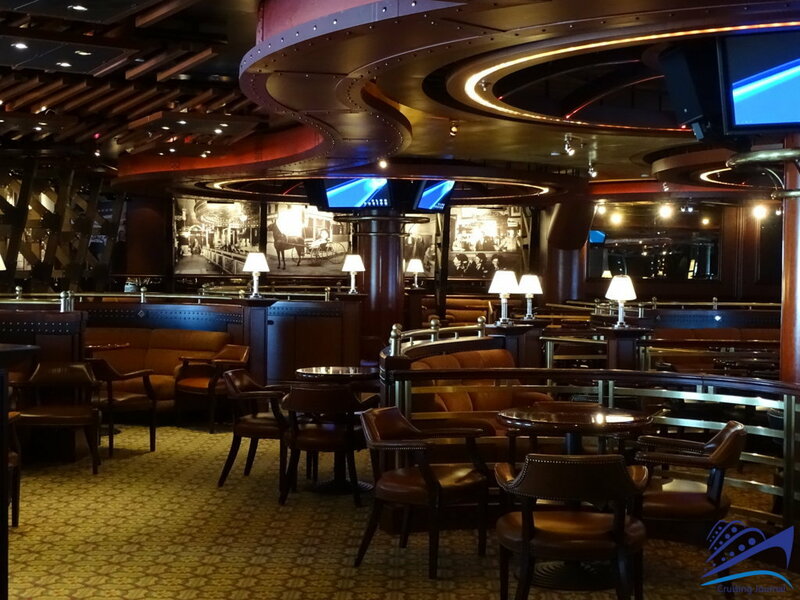 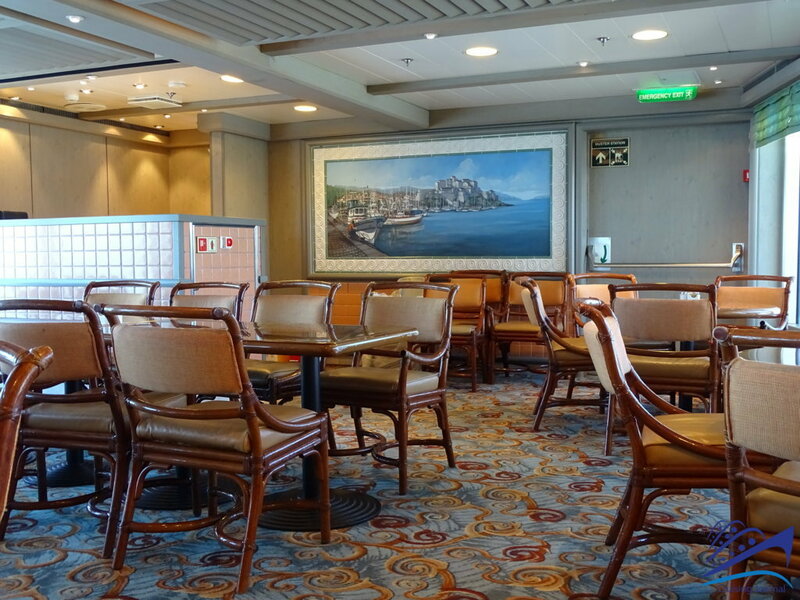 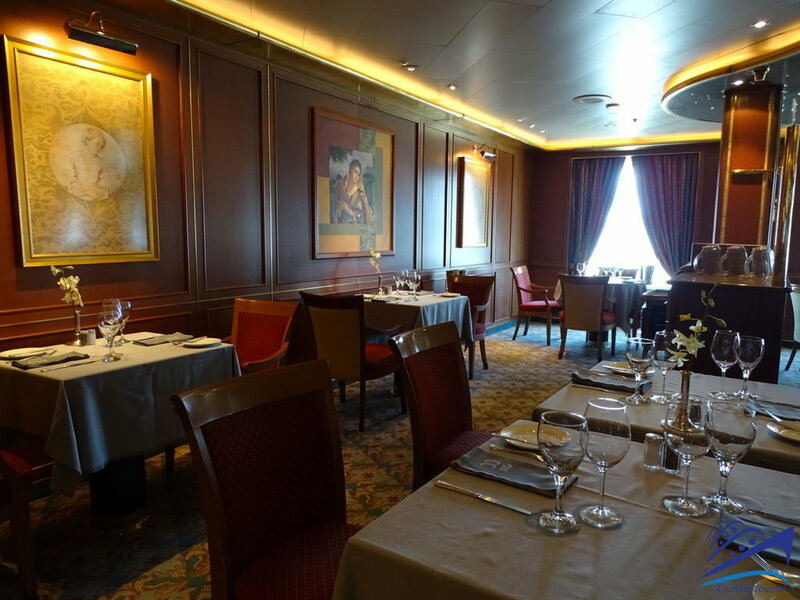 Towards aft end is the Da Vinci Dining Room, the ship’s second main dining venue. 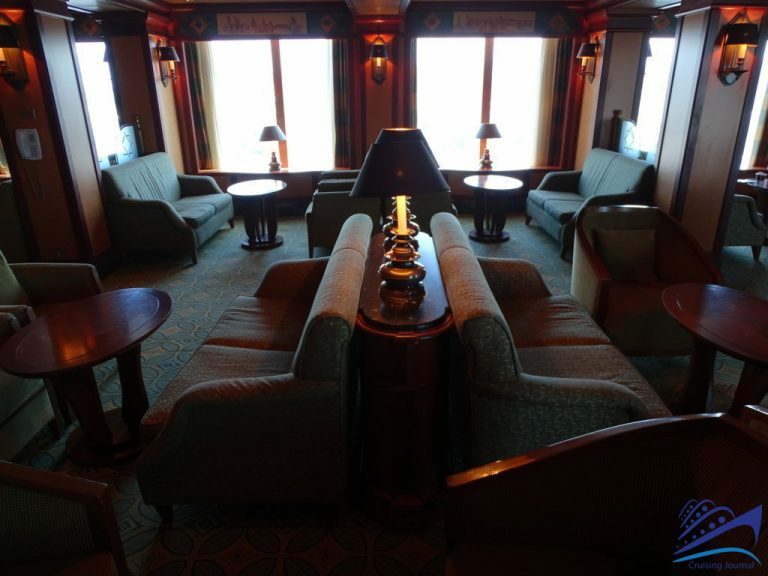 Going up to Deck 7 you will find an infinite number of venues where you can relax and have a drink or read a good book. 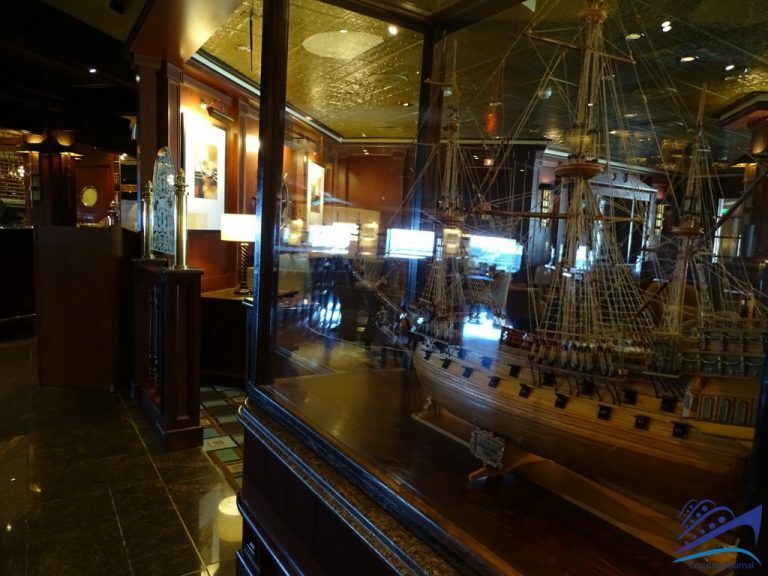 Sea and sailing enthusiasts will certainly fall in love with the Wheelhouse Bar, a spacious English-style pub with model ships and themed paintings. 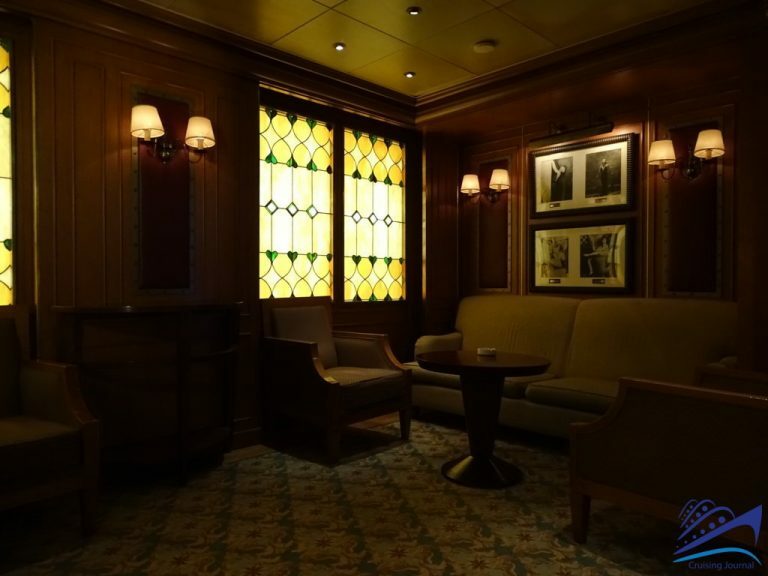 Not as cozy but nonetheless welcoming is the Explorer’s Lounge, a great place to be day or night but in the evening things get lively with live music and dancing. 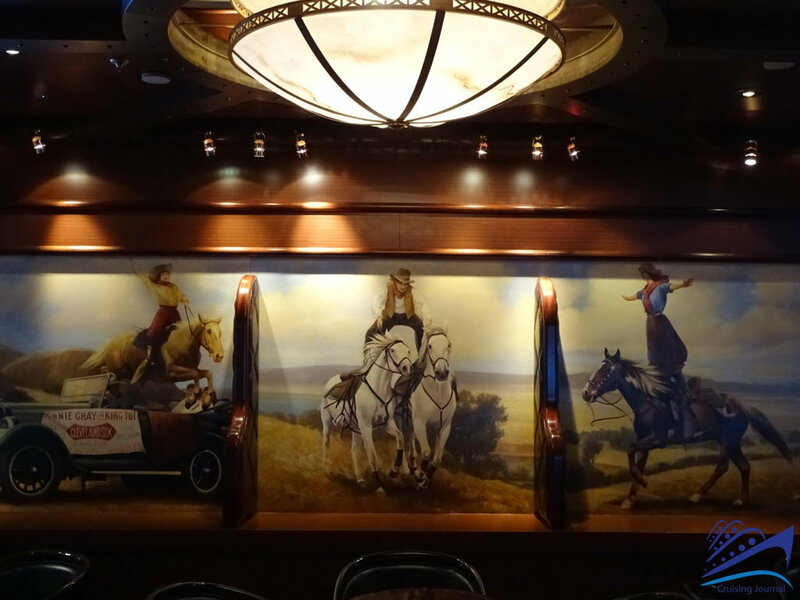 At aft end, you will find another venue that stays open until late, the Far West-themed Club Fusion with its beautiful vintage photos and saloon-style decor. 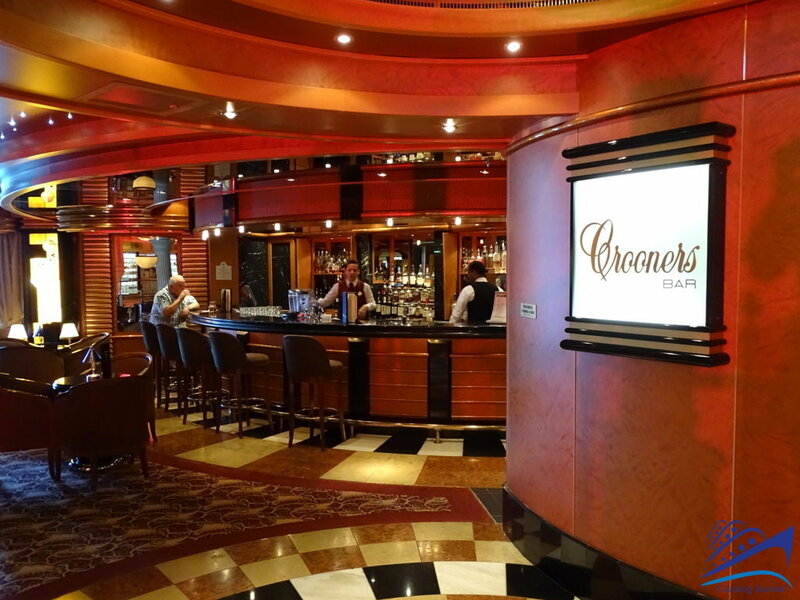 The Crooners Bar, partly overlooking the “Piazza”, is another vibrant spot where you can have an aperitif or enjoy some live piano music in the evening. 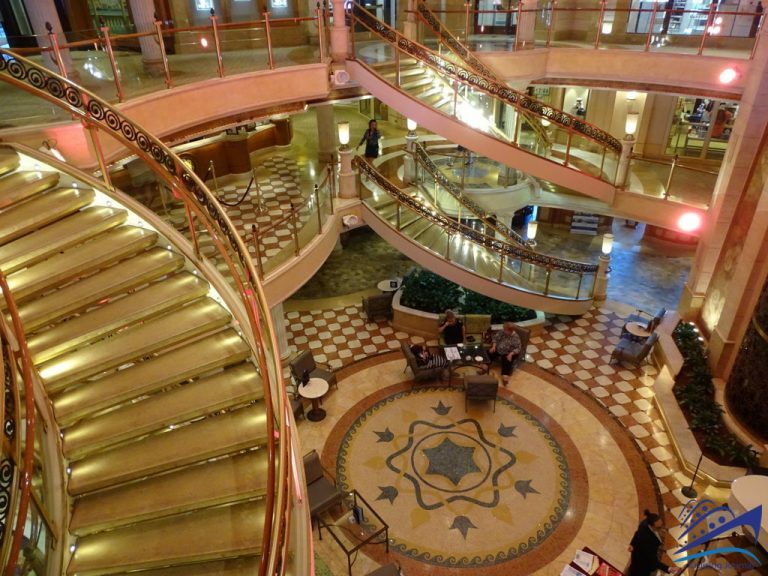 Moving forward from the atrium you will find a number of shops such as jewelry or perfume and cosmetics, a small but fascinating library, and the concierge of the Captain’s Circle. 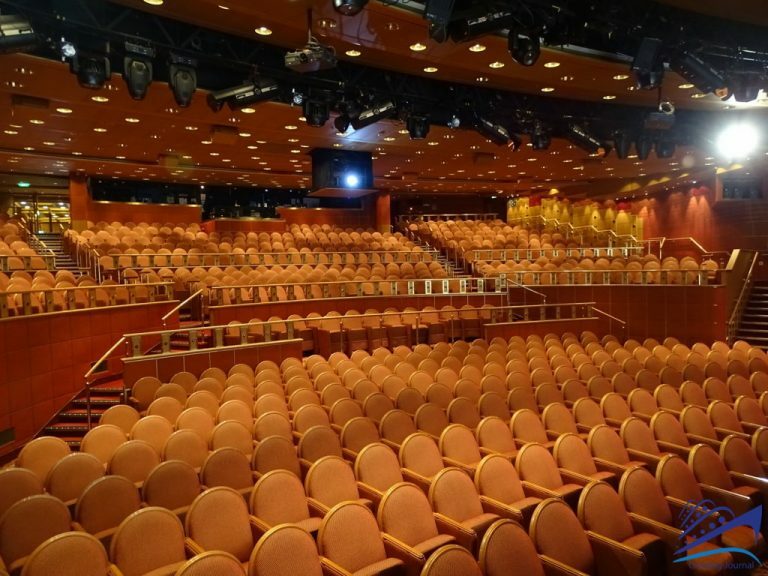 From here once you have reached the bow you will find the balcony seats of the theatre. Moving in the opposite direction towards aft from the atrium you will find yourself crossing the Photo Gallery, from where you can access the intriguing Crown Grill. 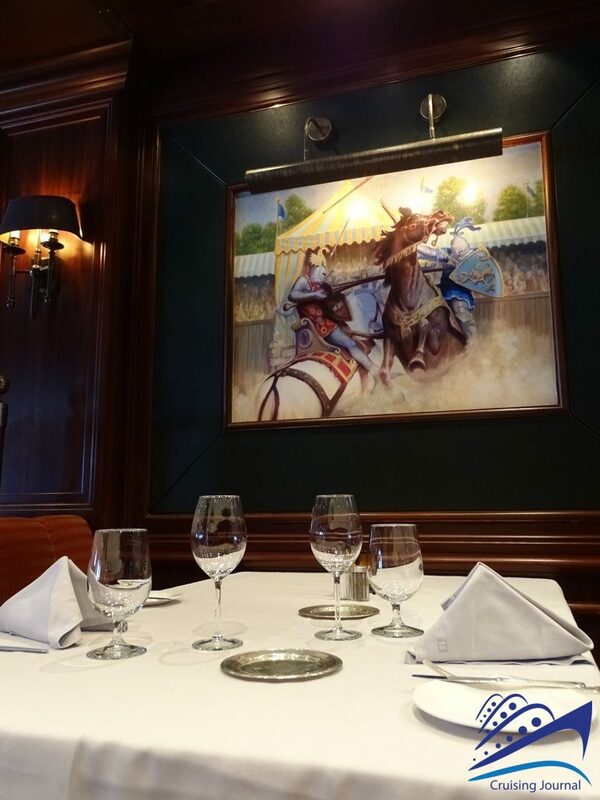 The restaurant is à la carte and it is inspired by medieval themes which will make you will feel as though you are dining with princesses and their knights. 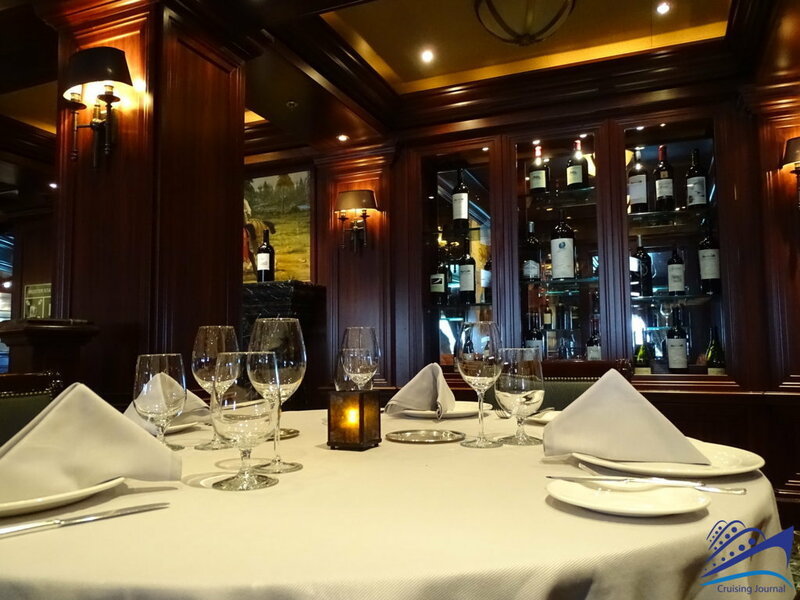 The kitchen of this elegant and cozy dining venue is partly open to view and the mise en place have quite a polished look. 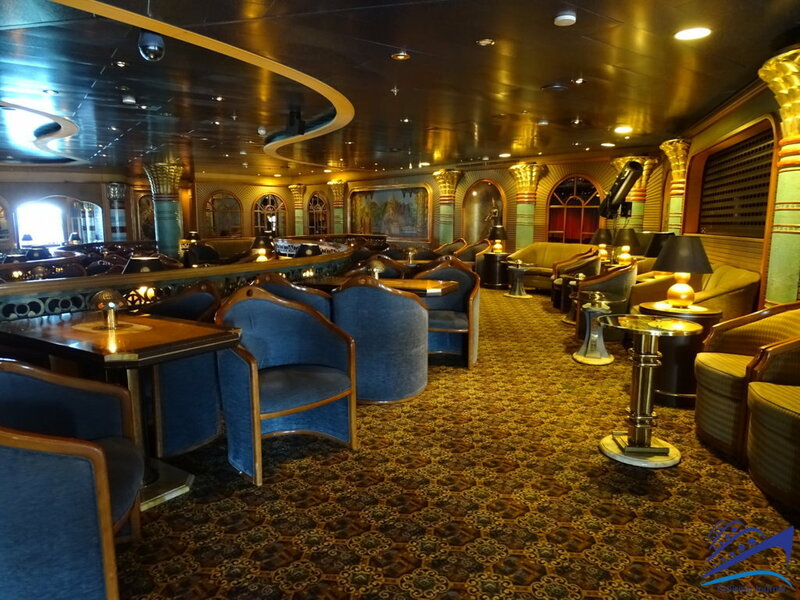 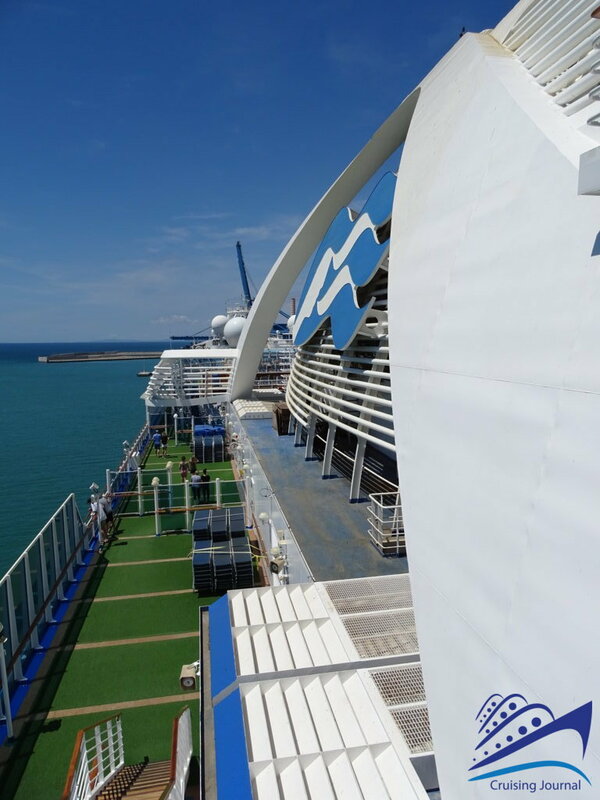 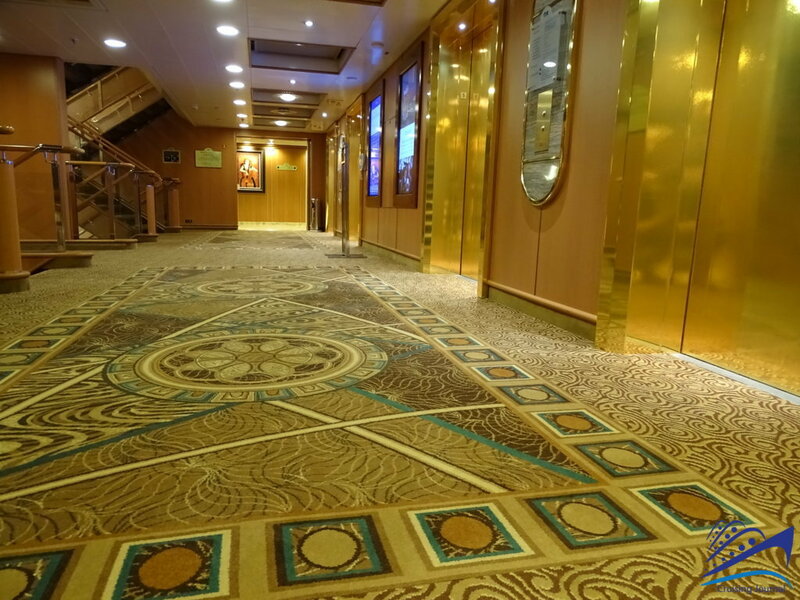 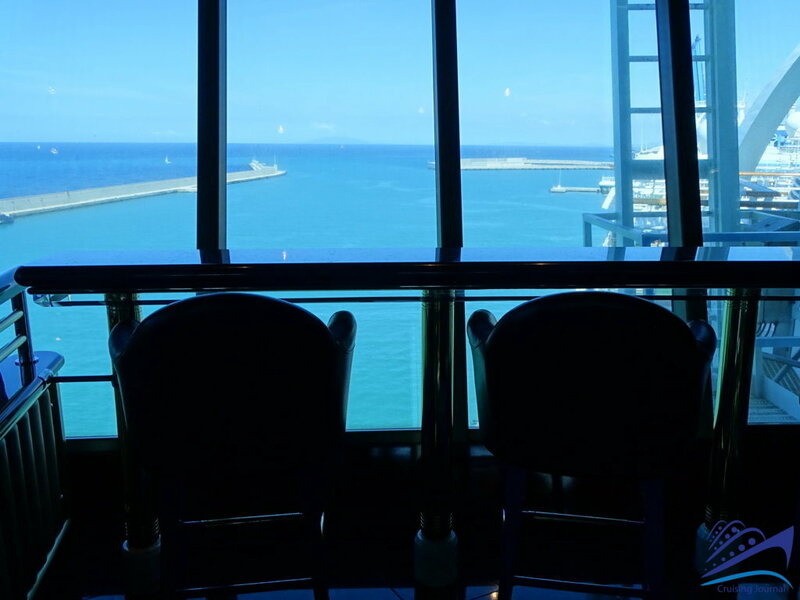 When going up to the upper decks, it is certainly worth your while to stop at Deck 14. 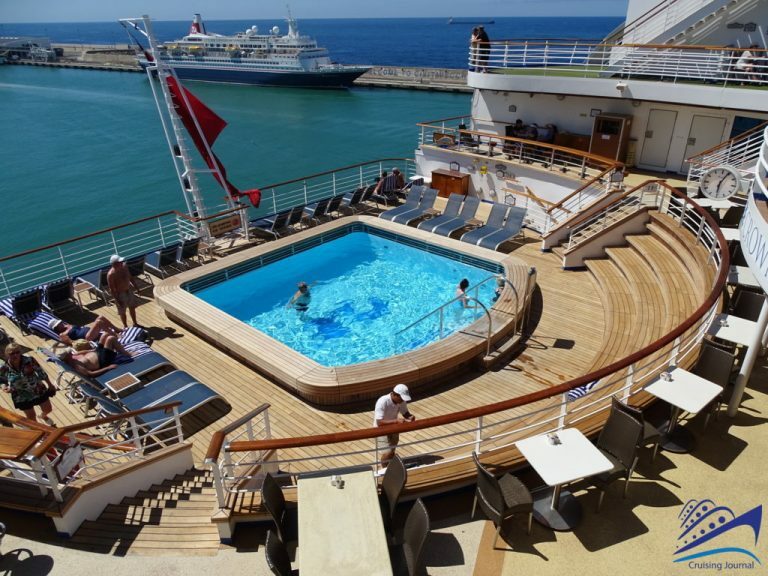 A small swimming pool, the Terrace Pool, opens up towards aft similar to the base of an amphitheater. The Horizon Terrace, which can be accessed from the Deck 15 Lido, is where you can sunbathe and enjoy a drink from the nearby Outrigger bar. 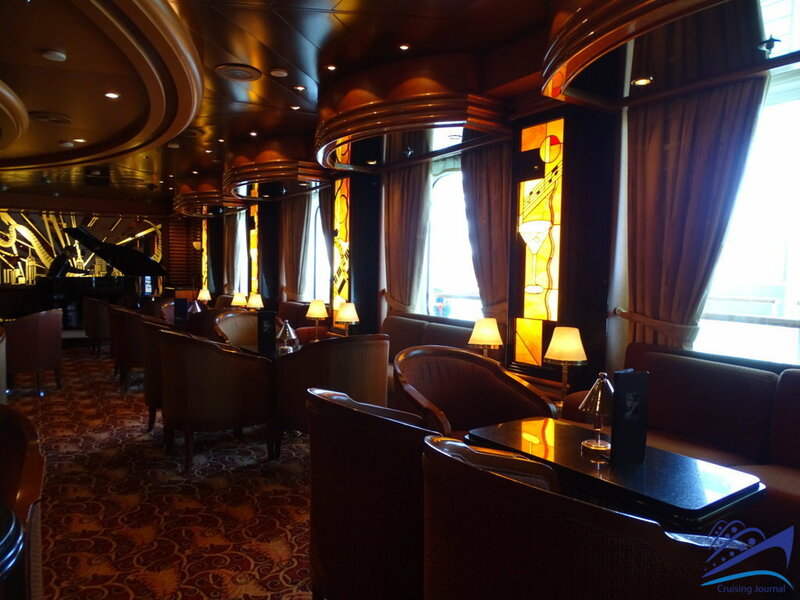 Refreshing yourself with a view of the wake of the ship is undoubtedly one of the most beautiful aspects of this class of ships. The Lido deck continues with a spacious buffet-style restaurant, the Café Caribe, at the far aft end and the Horizon Court going towards the two main swimming pools: the Calypso Reef & Pool and Neptune’s Reef & Pool. 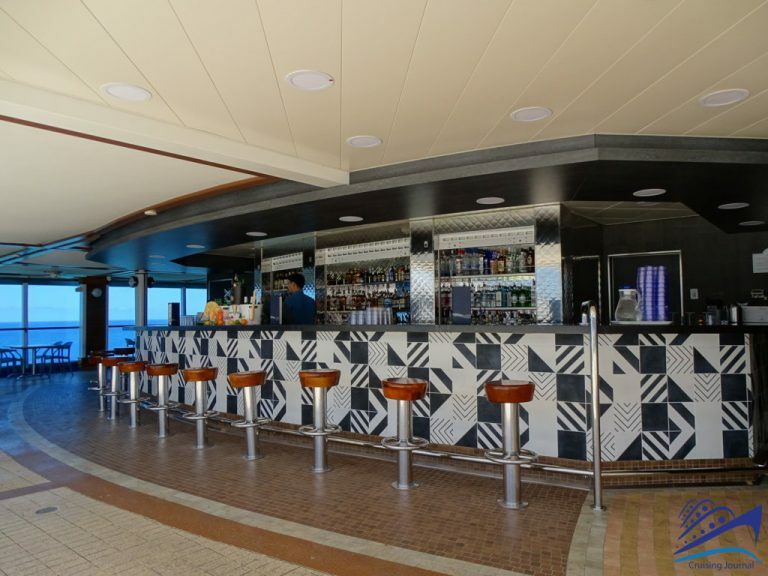 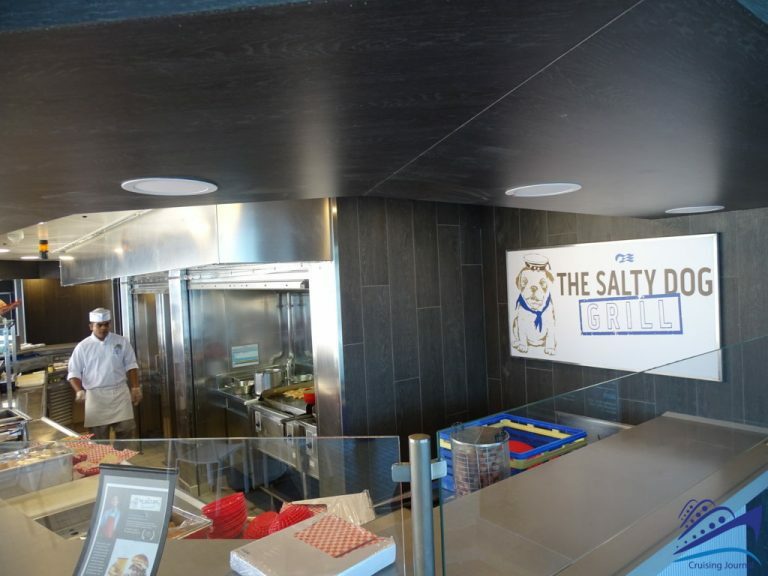 The Calypso Bar caters to the first of these pools whereas the latter has two inviting stations on one side that serve pizza and ice cream (Slice and Cone), and on the other side we have the Salty Dog Grill and The Mix Bar. 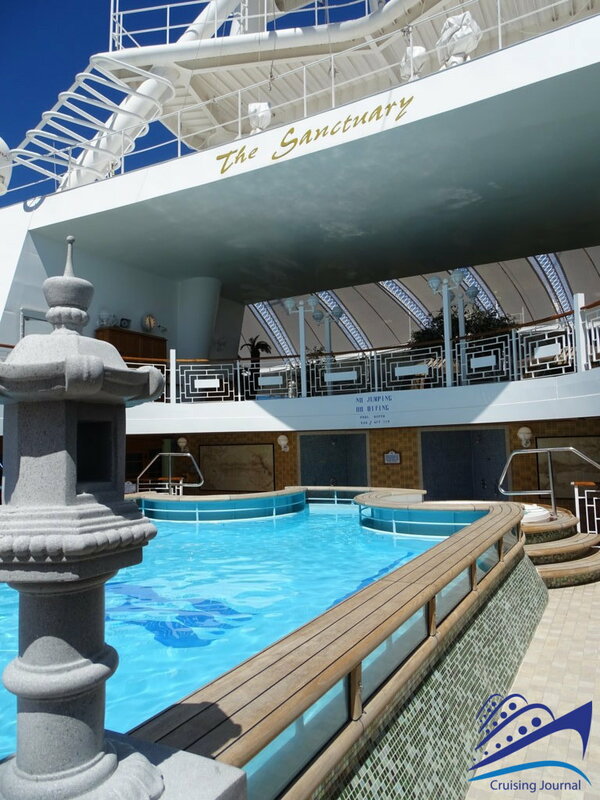 Both pools are equipped with a hot tub for the guests to enjoy. 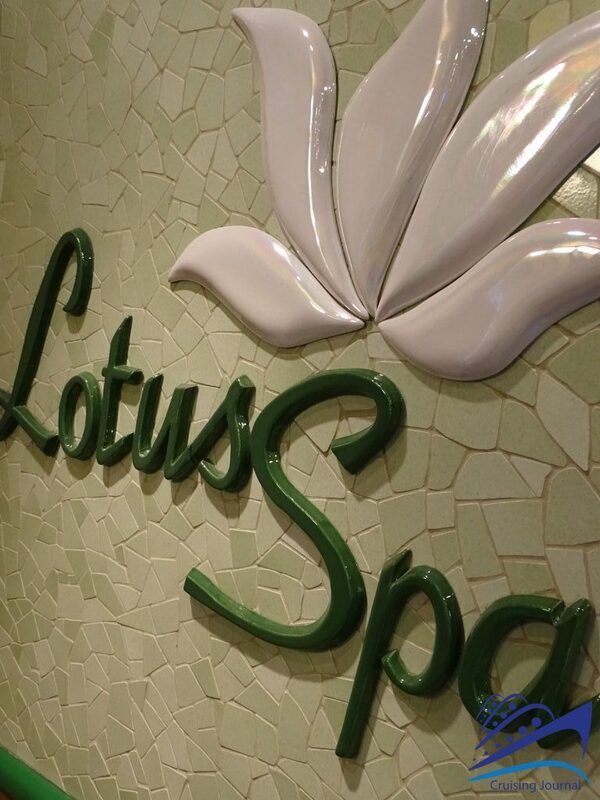 Going forward to the bow you will find the Thermal Suite of the Lotus Spa. 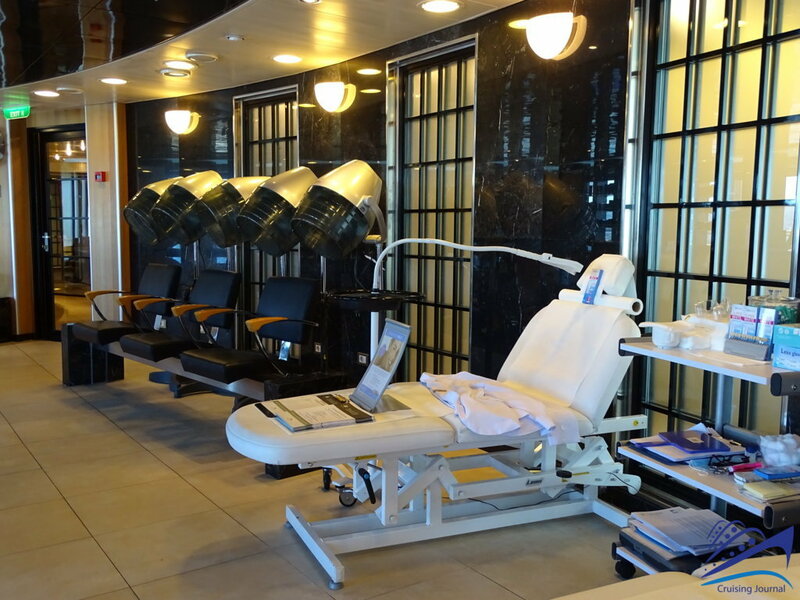 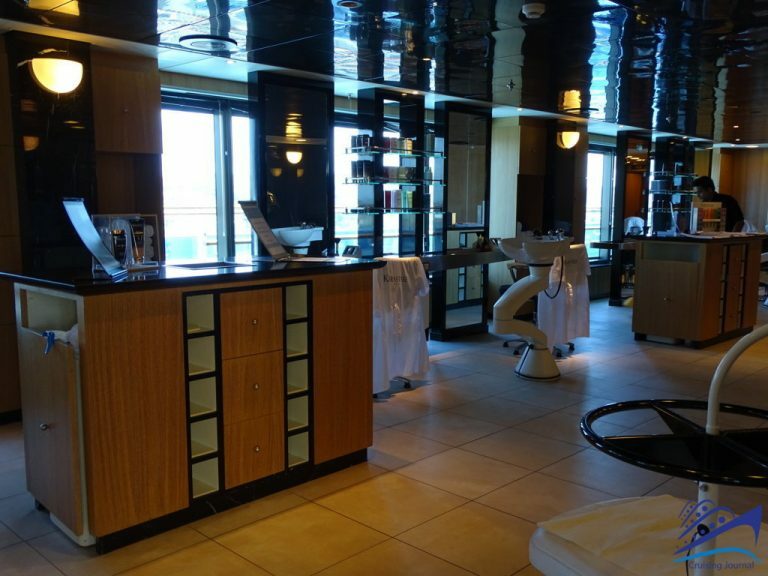 Going up to Deck 16 from the bow you will find all the other Spa facilities: the massage rooms, the aerobic room, the Fitness Center, the Beauty Salon, and the saunas. 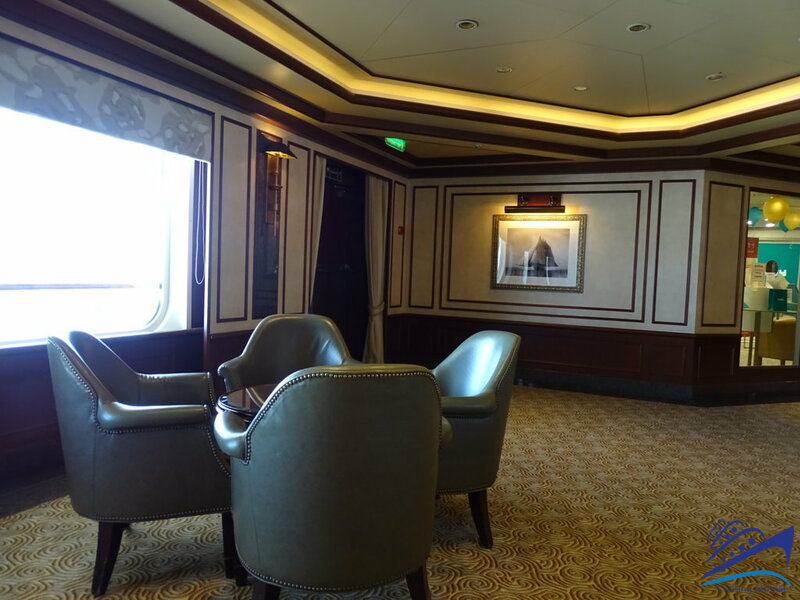 Worth mentioning is the Wedding Chapel located at the Spa exit, which can be used to renew wedding vows or for actual weddings…at high sea. 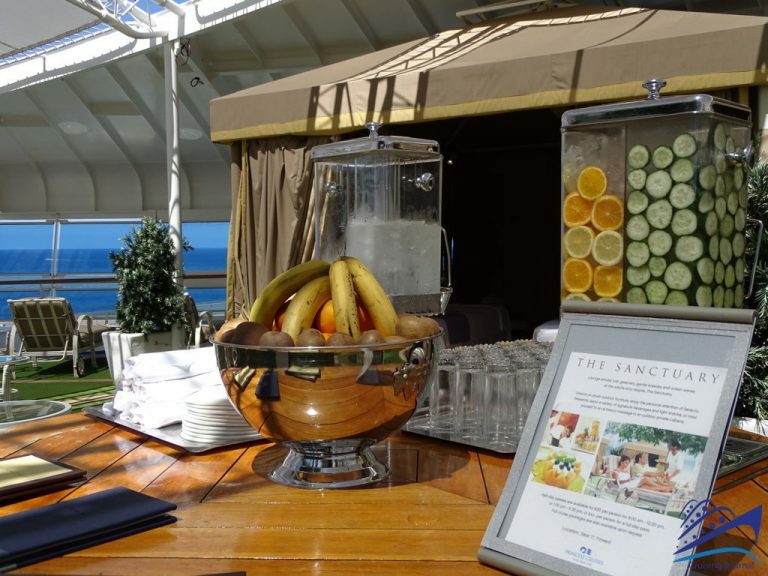 Once outdoors from there you’ll come across the Tradewinds Bar overlooking the pools and where you can have a drink and enjoy the sun and the sailing. 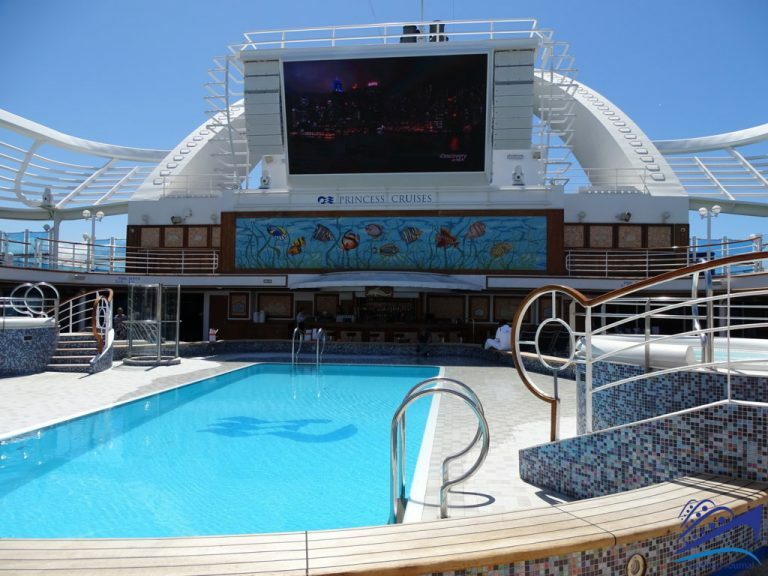 Right above Neptune’s Reef & Pool is the outdoor cinema Movies under the Stars where you can watch a film comfortably resting on the deck’s sunbeds or deckchairs. Starboard at aft end is the attractive Bar Adagio and port side is Sabatini’s. Two elegant venues where you can dine on Italian-inspired cuisine at Sabatini’s and later enjoy an after dinner drink listening to live music relaxing on refined sofas and admiring the paintings on the walls of the Adagio. 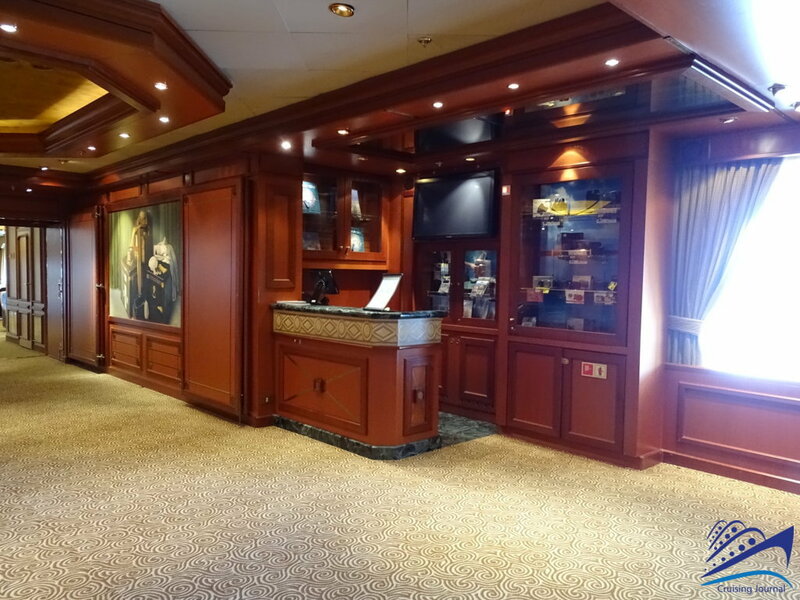 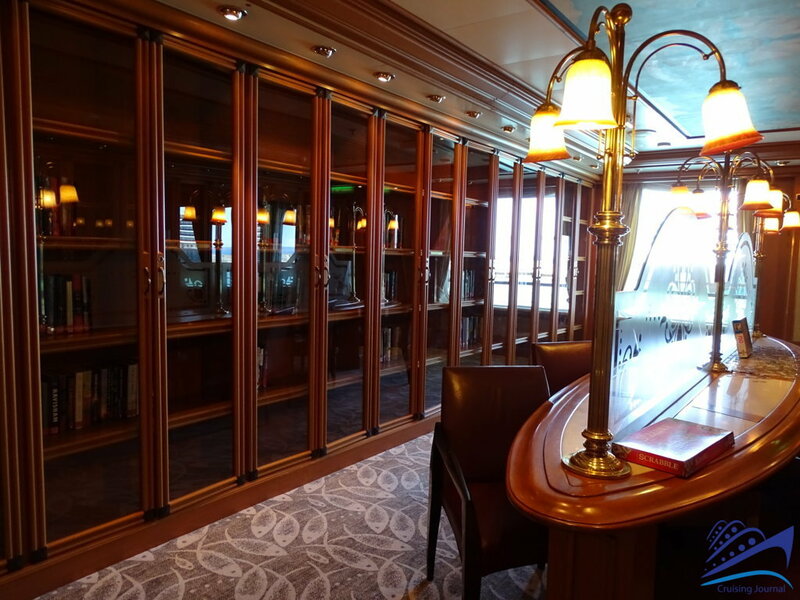 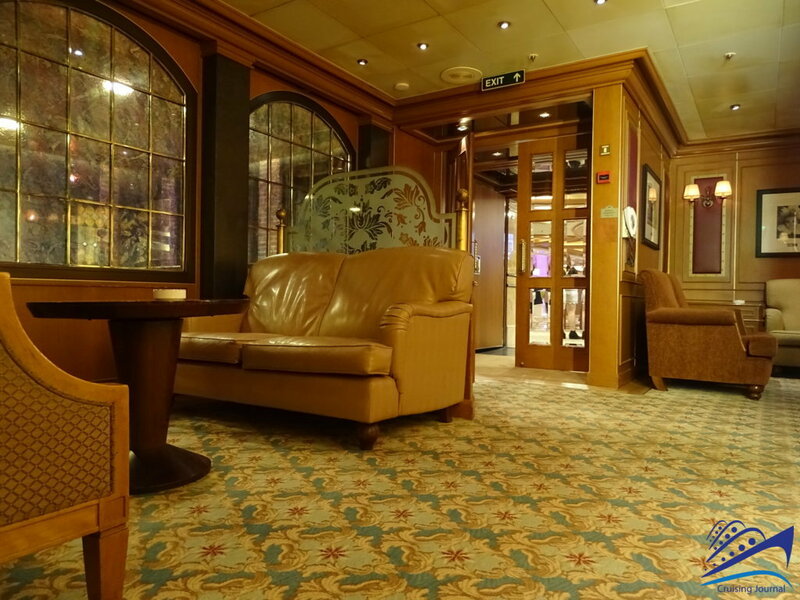 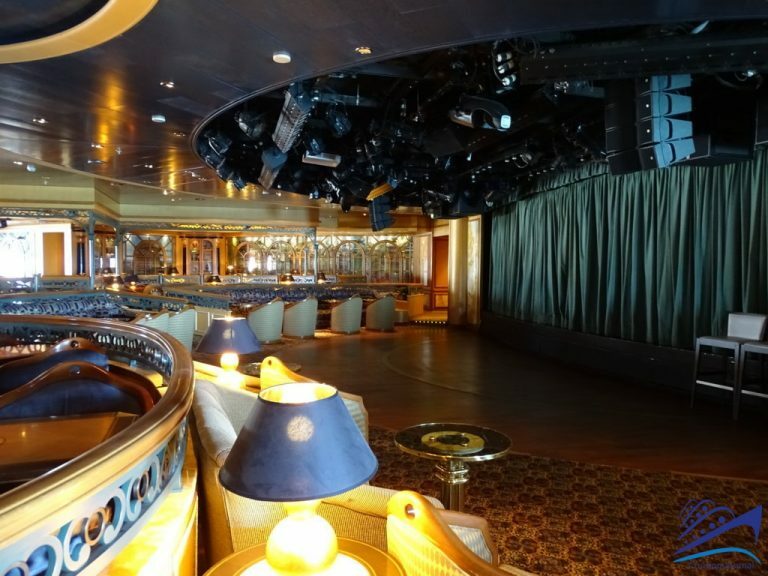 Perhaps one of the most beautiful venues of the Crown Princess is located at Deck 17: The Sanctuary, with cozy alcoves where you can relax with a drink or do some reading during the days at sea. 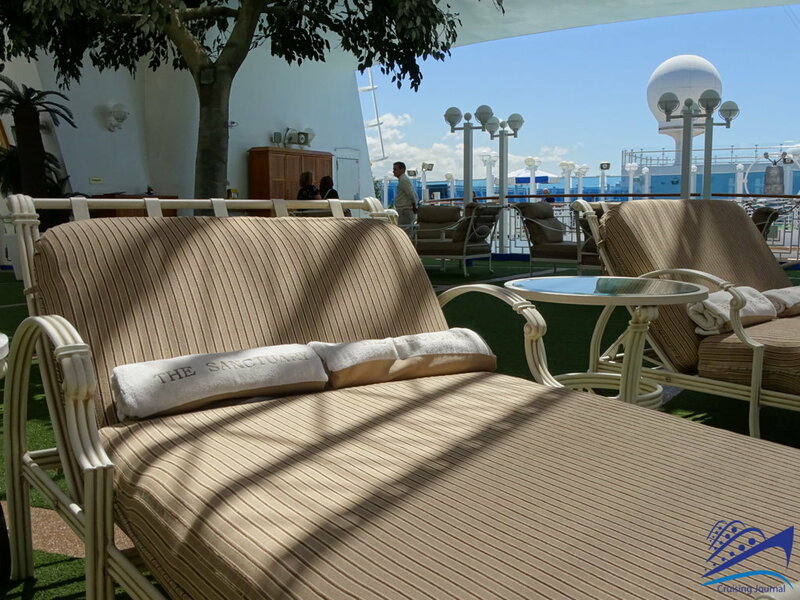 A small swimming pool, the Sun Terrace, is available for the guests and nearby is an ample space where one can sunbathe. 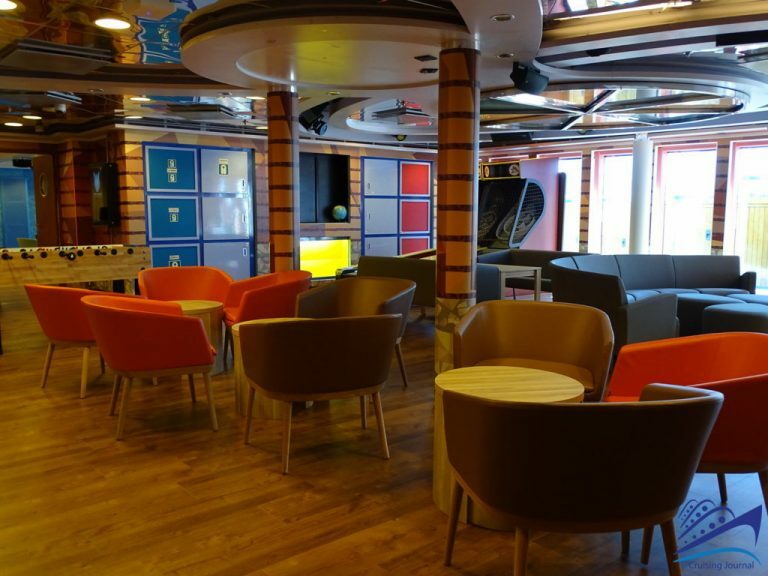 The area towards aft is dedicated to the younger passengers: Teen Center, Youth Center and Chill Out are facilities dedicated to children and teenagers, with lots of games, outdoor areas and a pool just for them to enjoy. The onboard discotheque, Skywalkers Nightclub, is located at Deck 18. 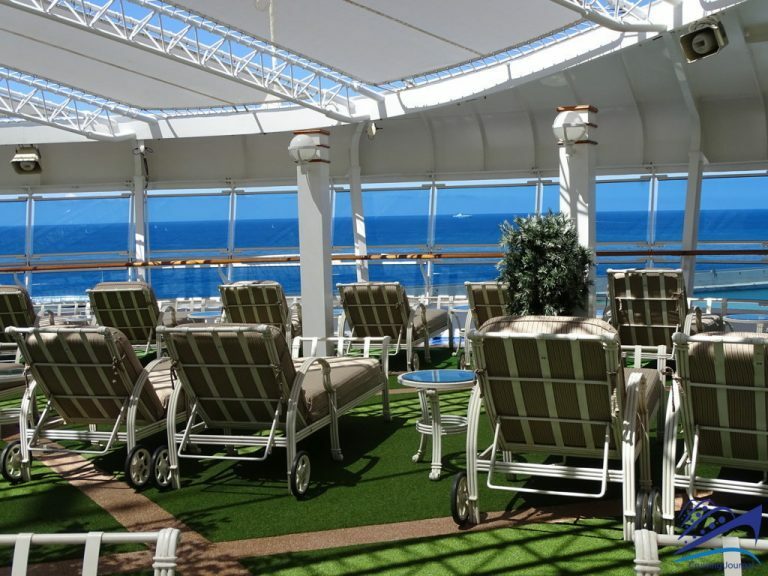 The height of this deck makes it an excellent observation point even during the day when the lively lounge is closed making it the ideal place to go and relax. 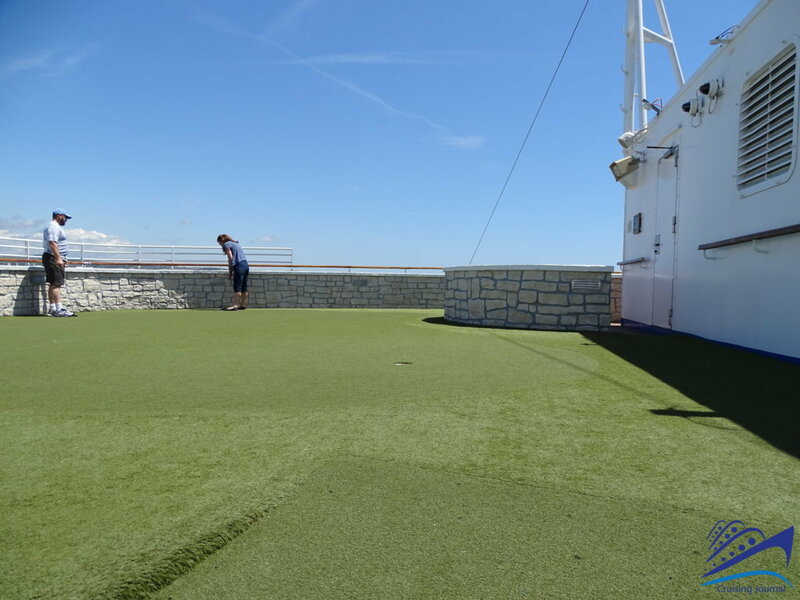 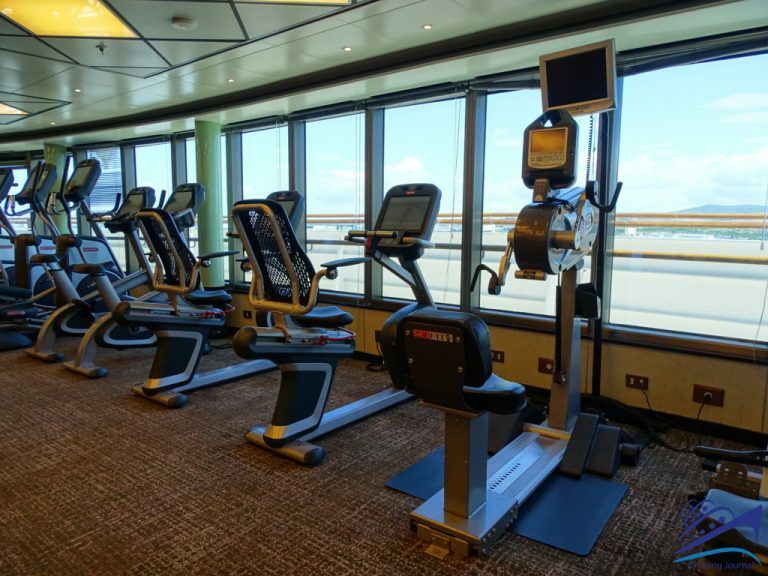 If you go up one more level to Deck 19, you can go jogging on the outdoor jogging track; play team sports at the multi-purpose sports court, Center Court; or, take advantage of the mini golf course across from the sports court. At the Platinum Studio, you can have your photo taken professionally. 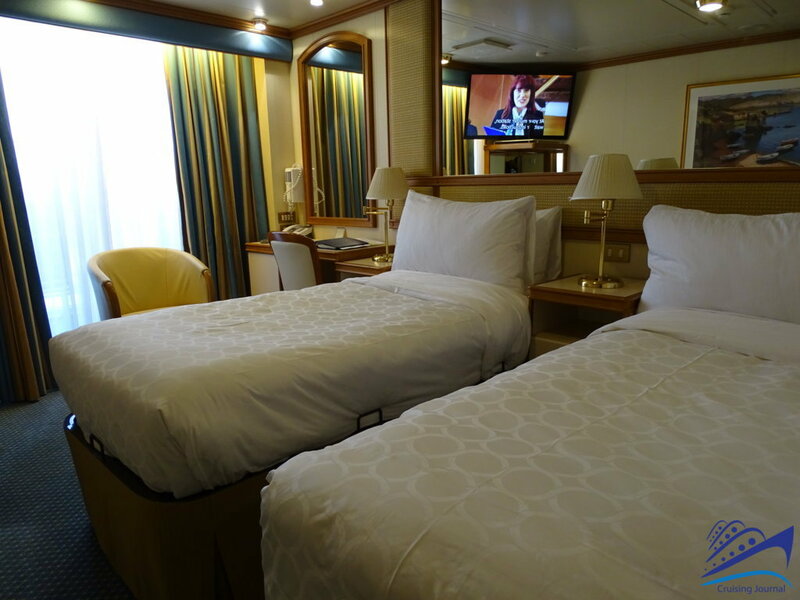 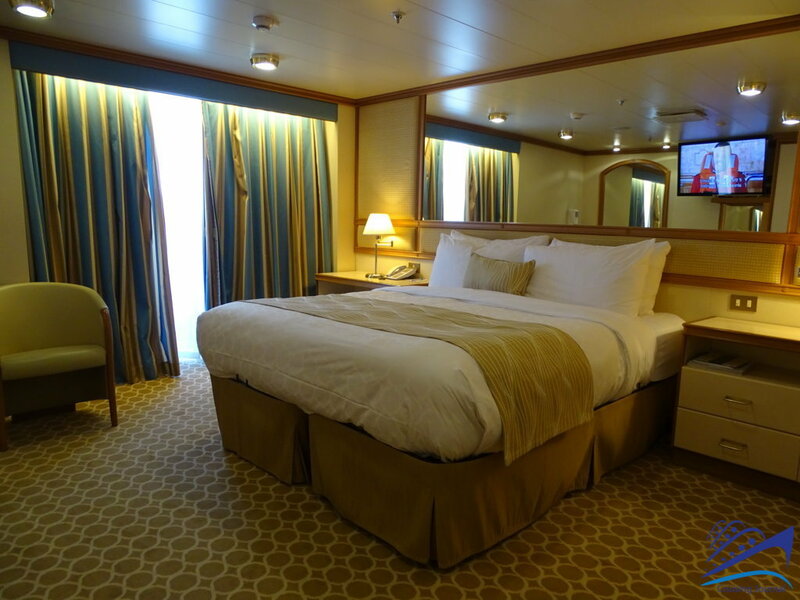 Obviously, on a state-of-the-art ship such as this one and with these dimensions, accommodations are available to suit every taste and budget. 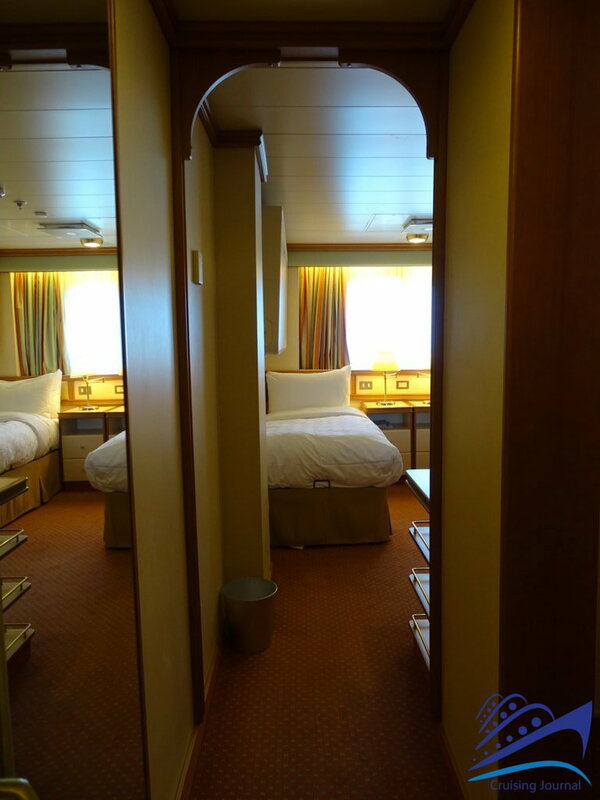 The inside cabins are much smaller than the others are but they can comfortably accommodate two people. 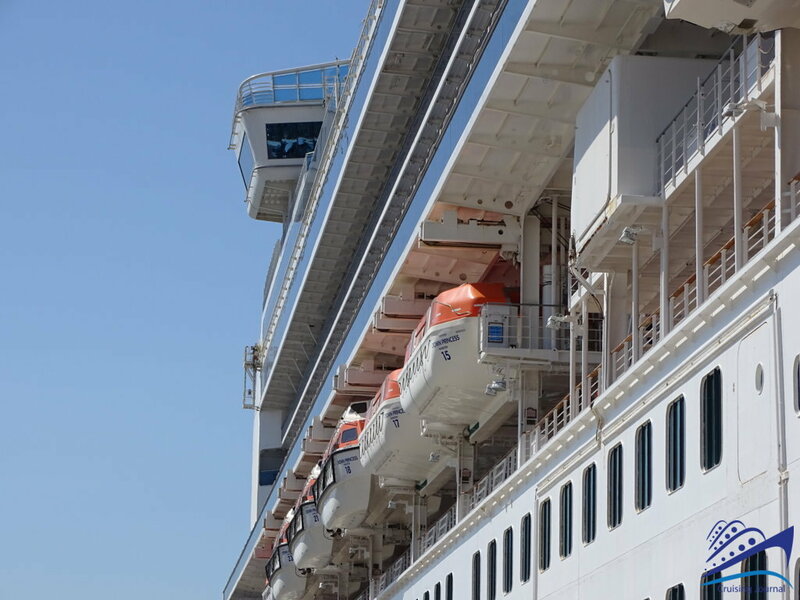 The outside cabins and the ones featuring a balcony have the advantage of having natural daylight in their room. The icing on the “cruise experience” cake would be to go one-step further and book a suite on this incredibly fascinating ship.